Today we left Charlottesville, our ultimate destination is Arizona. Well, we did make it out of C’ville after a few tough hours of trying to “hitch” the trailer to our car. We have enough motor home experience to know that there is a learning curve and our Hensley Hitch is proof that we are still learning. Hooking up the trailer to the car only took three or four hours and a call to the emergency number at Hensley Manufacturing. Oh well “living the dream” sometimes can become a “nightmare”, but for some reason this doesn’t seem to bother Eddie. He just chalks it up to learning the systems. We left home at 9:30 and finally left C’ville at 3:00 PM. We only drove as far as Lynchburg where we spent the night in the parking lot of a Cracker Barrel restaurant. Nice meal and a good nights sleep. Cracker Barrel restaurants are RV friendly with enough “working room” to maneuver RV’s in their parking lots and like Walmart, Flying J and several other RV friendly retailers they let you spend the night in their parking lots. These businesses have learned that when RVs stay in their parking lot the owners will spend money in the businesses. We have read that the average owner of an RV that stays in a Walmart lot spends $200+. We don’t know what our average is, but we never leave without spending money to stock up for the road trip. We arrived at Oak Hollow Campground in High Point North Carolina where we stayed until Thursday. We came to High Point for two reasons, most importantly we came because Stimp Hawkins, a teacher and football coach of Eddie’s lives close by. Stimp has been a tremendous influence in Eddie’s life, he just celebrated his 81st birthday and Eddie wanted to spend time with him. 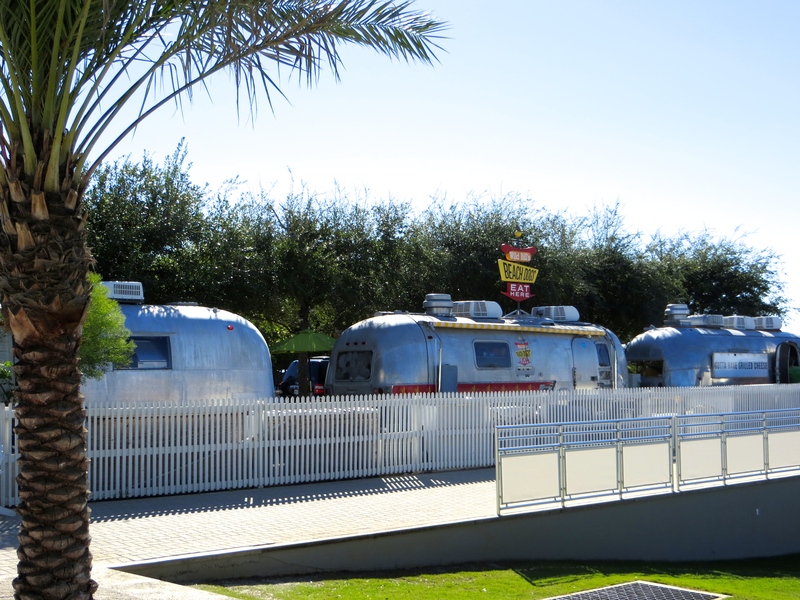 The second reason was because we needed to have some small warranty items taken care of on the Airstream. We met Stimp at Out Of Doors Mart where we were having the work done on the AS. We had a nice visit with him in our living room and then he took us to lunch. After saying our good byes we headed to Asheville, NC. 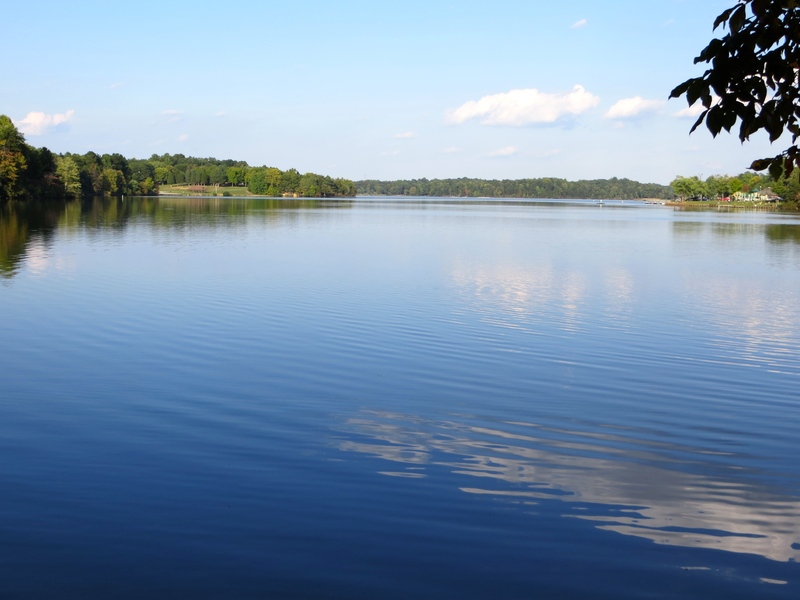 Our site in High Point was next to a beautiful 800 acre lake that provides High Point with its water. We got to practice our backing up skills which still need a lot of work. Roberta took a turn, and her goal was to back in site #2 which had plenty of room on both sides. After a few tries and some good ole fashion cussing, she managed to back in perfectly. There was only one problem, she was in site #4 instead of site #2! The biggest issue with backing up is that you can’t see behind you because the trailer blocks the view. We have both taken driving courses to drive a “big rig” but backing up a trailer is entirely new. 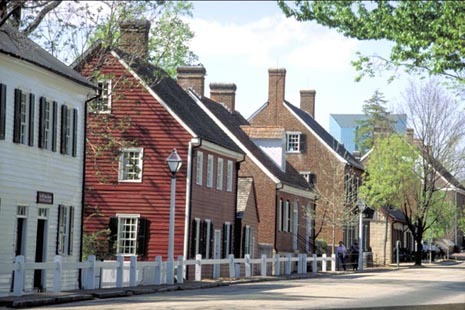 A wonderful part of staying in High Point was a day trip we took to Old Salem, which is in Winston Salem. 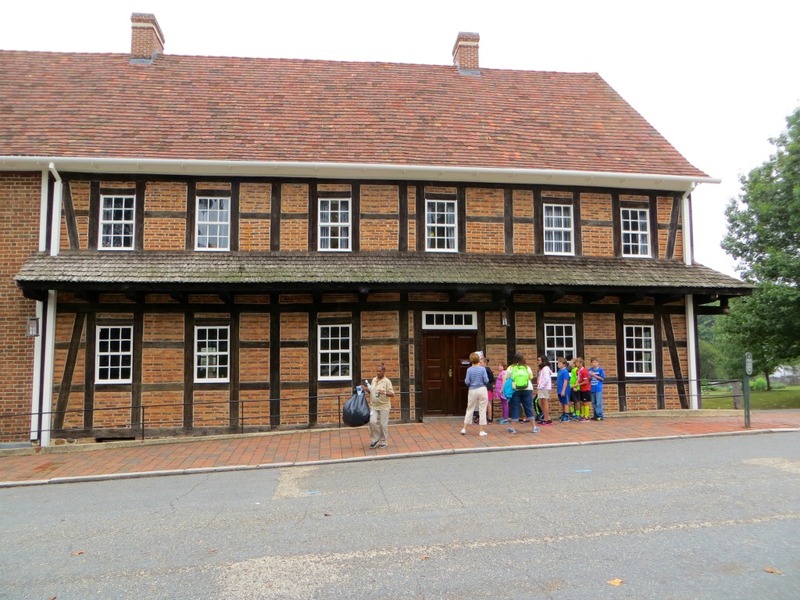 The community was established in 1766 by the Moravians as a place to worship and train their young men to learn trades. The community reminded us of what Williamsburg looked like in the 1950’s, walkable, friendly and beautiful. We had a wonderful tour of The Museum of Early Southern Decorative Arts and saw some of the earliest original furniture in America. We arrived at Bear Creek Campground in Asheville, NC late in the afternoon. It was a clear and chilly evening; wonderful fall mountain weather. We have stayed in this park before when we had our motorhome and have enjoyed each visit. 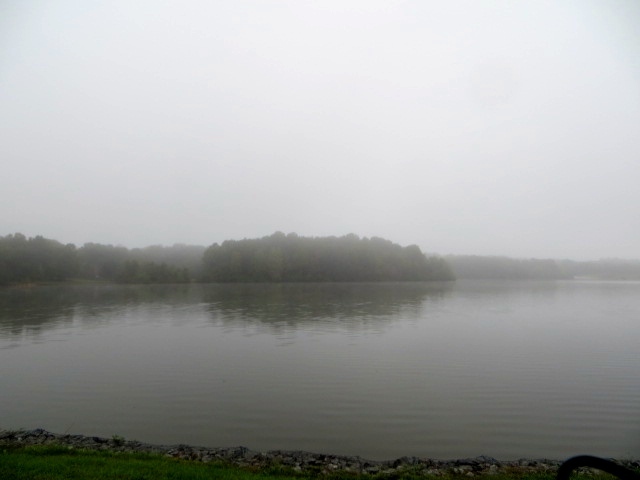 We left Asheville early Thursday morning in cloudy weather headed to Vogel State Park. We left Asheville early in the morning it was chilly and cloudy; we were head for Vogel State Park. Vogel State Park is in the mountains of north west GA, near Blairsville. We had barely gotten on the road when it started to rain, we drove through rain most of the day a new and somewhat harrowing experience when you have 7% grades, wet roads, and you’re towing a 7,500 lb trailer. When we were almost at Vogel we called to see if they had a “pull through” campsite. We discovered that not only were there no “pull through” sites, there were no campsites available; they were full! Calling ahead is blasphemy to real RV travelers (at least to one of us, you can guess which one); only people staying in motels or hotels worry about reservations. We have our our home behind us and can say stop when we want. Long story short ……it is fall leaf season in the mountains of Georgia. No problem; we just kept going and stayed in a Walmart parking lot in Forsyth, GA. It was comfortable, safe, and a nice place. 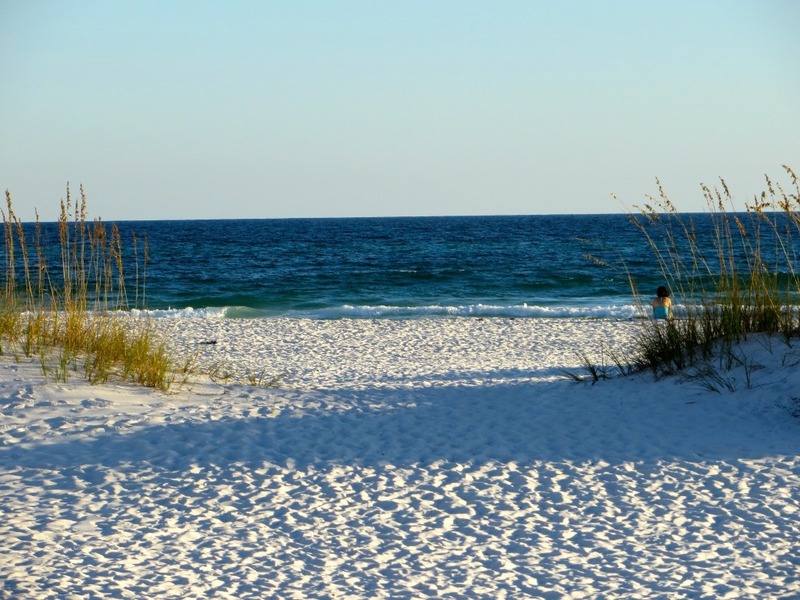 We arrived with reservations at Camper’s Inn, RV Park in Panama Beach, FL. The RV park got high marks in the Good Sam’s directory but it really was not very nice. That’s why you don’t make reservations in advance, and if you have to make reservations in advance, you only make them for one night. That way if the park turns out to be less than you expected you can leave the next day, if you like it you stay. Another little “titbit” private camp grounds aren’t the nicest, given the choice it is always best to stay in National Parks, State Parks, or Municipal Parks. Camper’s Inn wasn’t terrible and the people were nice so staying tor two nights was fine. 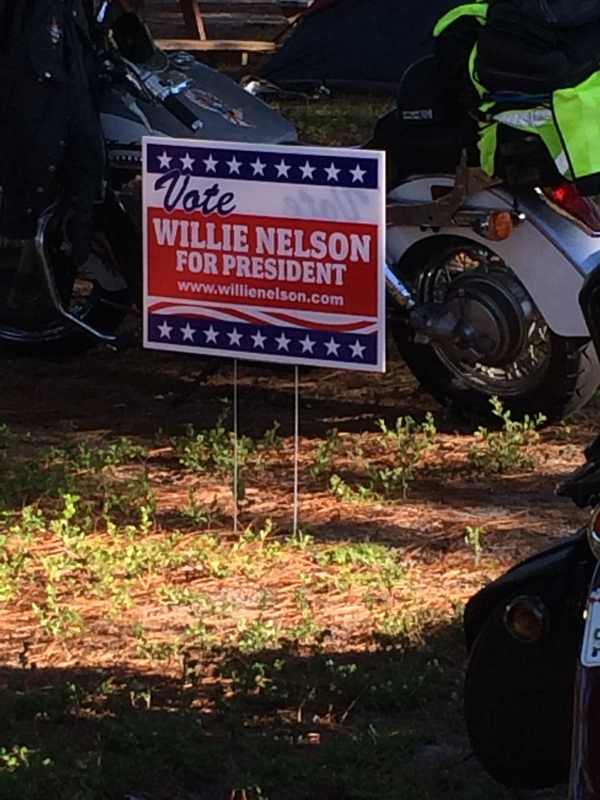 As it turned out it was motor cycle week and the main rally venue was right across the street from Camper’s Inn. 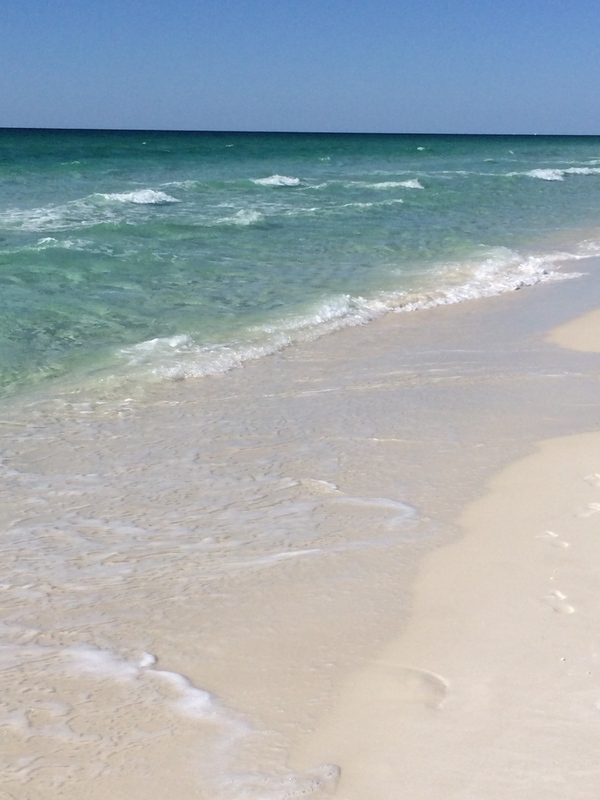 Panama Beach wasn’t what we expected; it reminded us of Virginia Beach. The ocean was wonderful but it was a tacky beach strip. Saturday we drove west on route , a scenic highway, (follows the gulf coast) through Rosemary Beach, Water Color Beach and Seaside Beach. 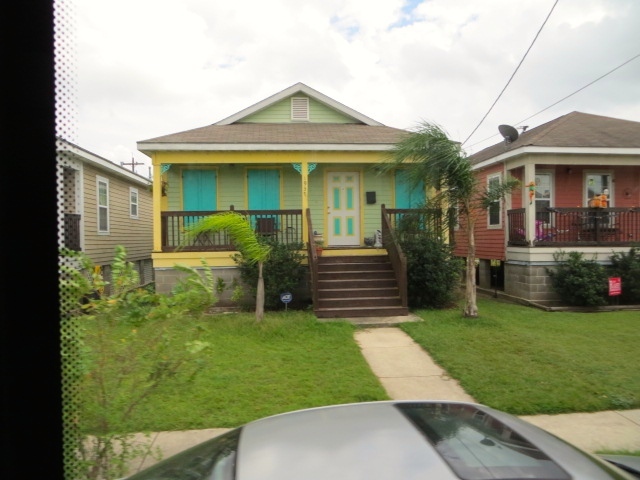 Each of these planned communities is beautiful, quaint and what we had expected to find along the Gulf Coast. 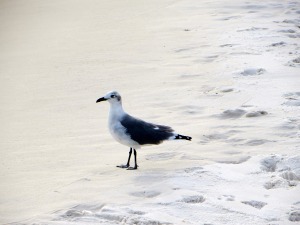 We stumbled across Henderson Beach State Park, in Destin Florida. It is a beautiful Florida State Park.We were lucky enough to get into Henderson Beach State Park for two nights. Someone told us that people make reservations eleven months in advance. The sites are large and well landscaped and the beach is wide with white sand. We loved staying here, this is what we had hoped to find! Another VSP ( Very Special Place) The days were hot and sunny and the evenings were cool with a nice ocean breeze. 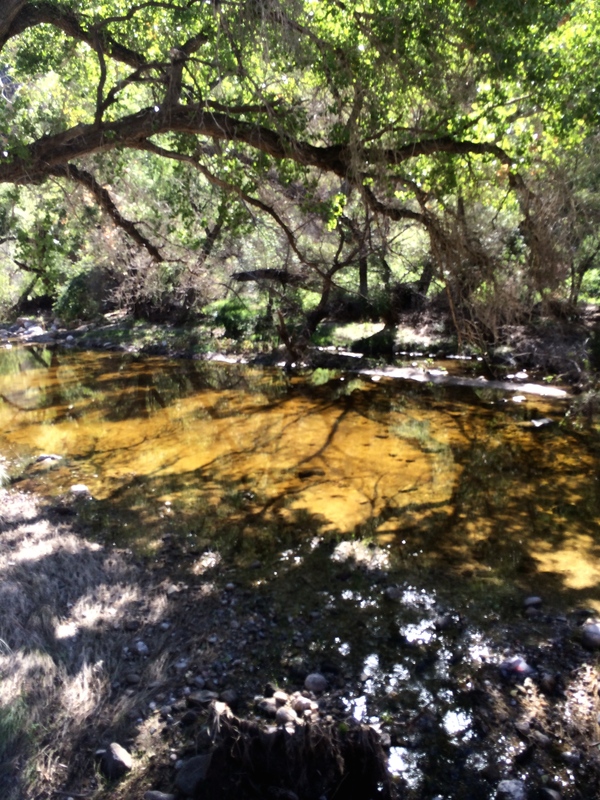 Henderson State Park – Fantastic! 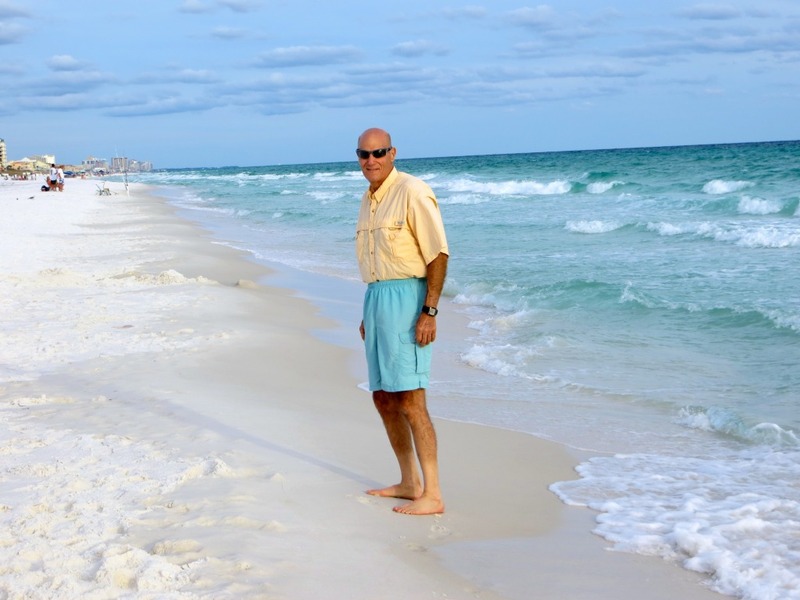 Could anything be nicer than Henderson Beach State Park……….before we arrived at Fort Pickens National Park we would have doubted it. 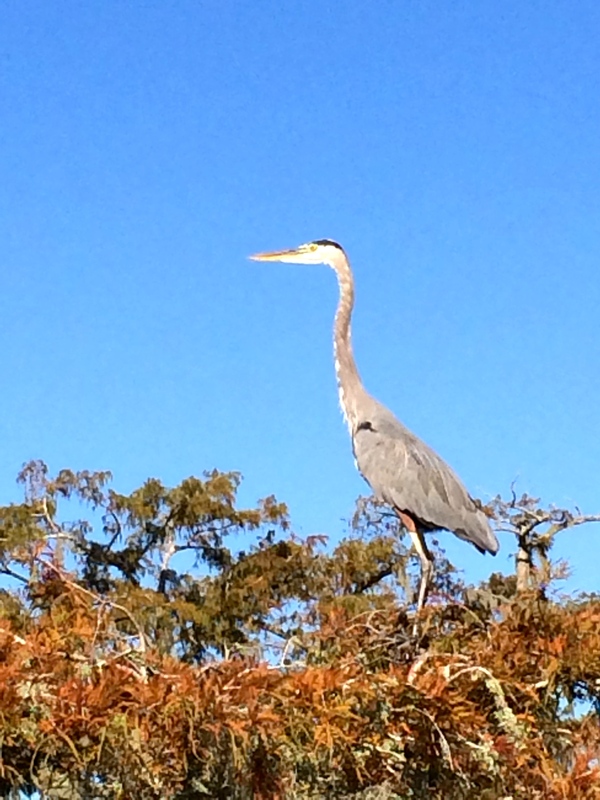 But when we arrived at Fort Pickens National Park near Pensacola Beach we were over whelmed with its beauty. We didn’t think that we would find anything nicer than Henderson Beach State Park but Fort Pickens National Park tops it ( VSP with **). 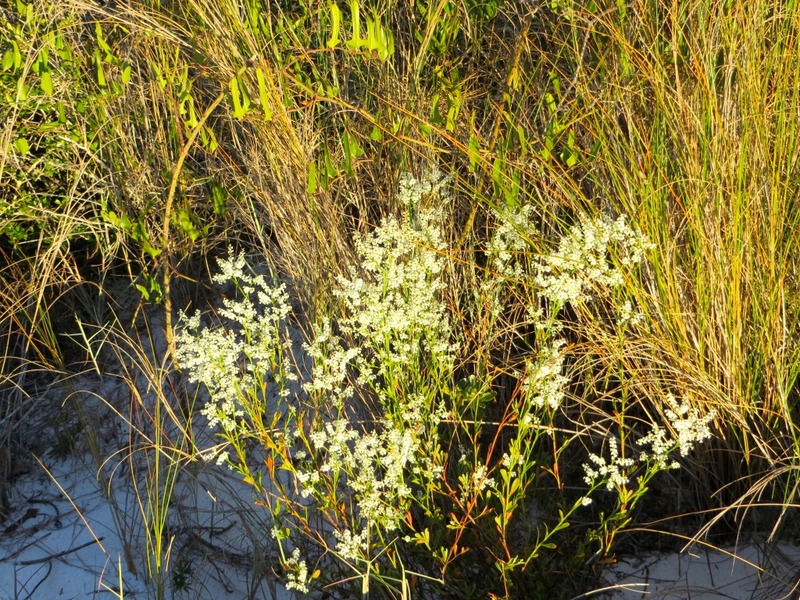 Fort Pickens is on a barrier island between the Gulf of Mexico and Pensacola Bay. The camp ground is not as nice as the camp ground at Henderson Beach but the surroundings were breath taking! When you were on the beach there wasn’t a condo, house, or hotel in site; just a beautiful white beach with crystal clear water as far as you could see. 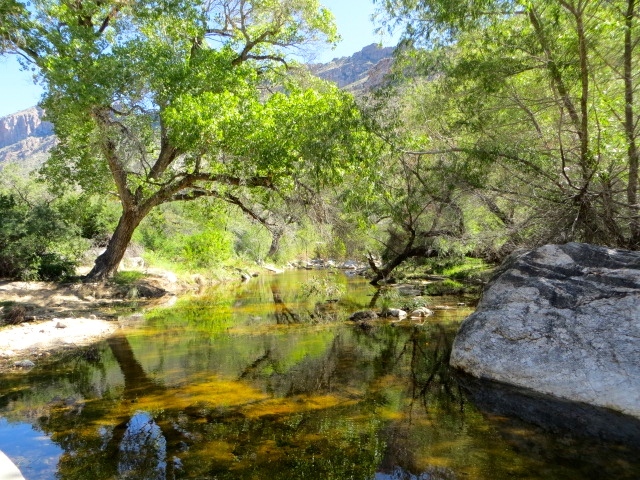 If you are within two hundred miles of a national park; don’t miss it! We have never visited a national park that wasn’t fabulous. 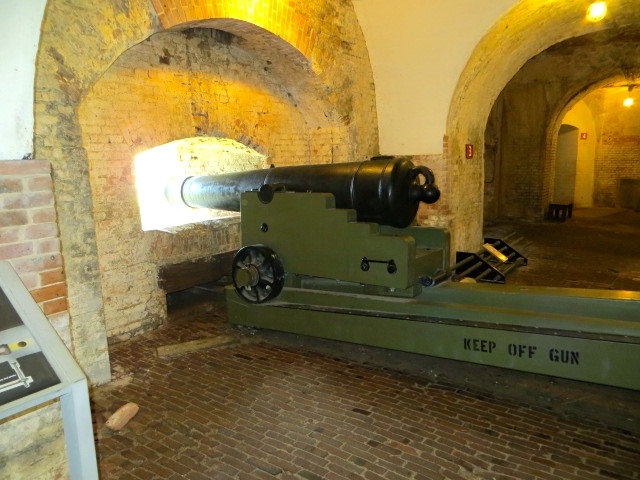 We toured Fort Pickens which was built between 1829 – 1834 to defend Pensacola shipyard and the coast line of the United States, sadly we discovered that the only time that the fort was fired on was during the civil war when we were fighting each other. 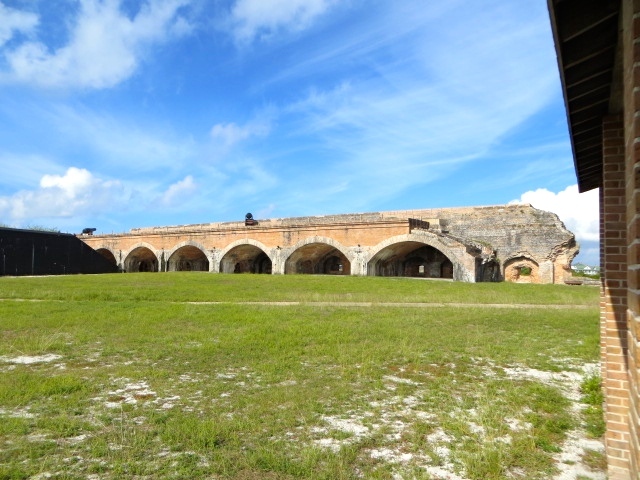 It took five years to build Fort Pickens, with slave labor, and 21 million bricks were used. 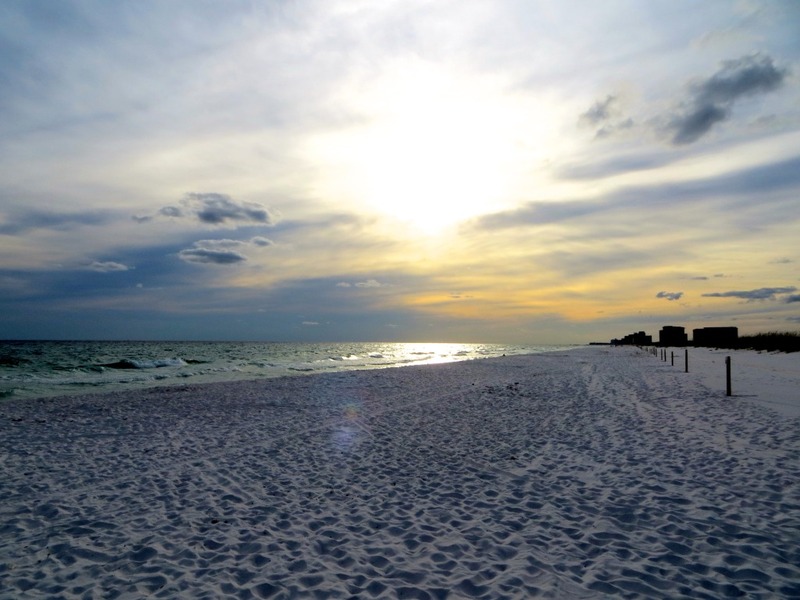 Didn’t Believe Anything Could Be Prettier Than Henderson Beach – Fort Pickens Beach Is! While we were there the moon was full and since there was no light pollution it was especially beautiful. 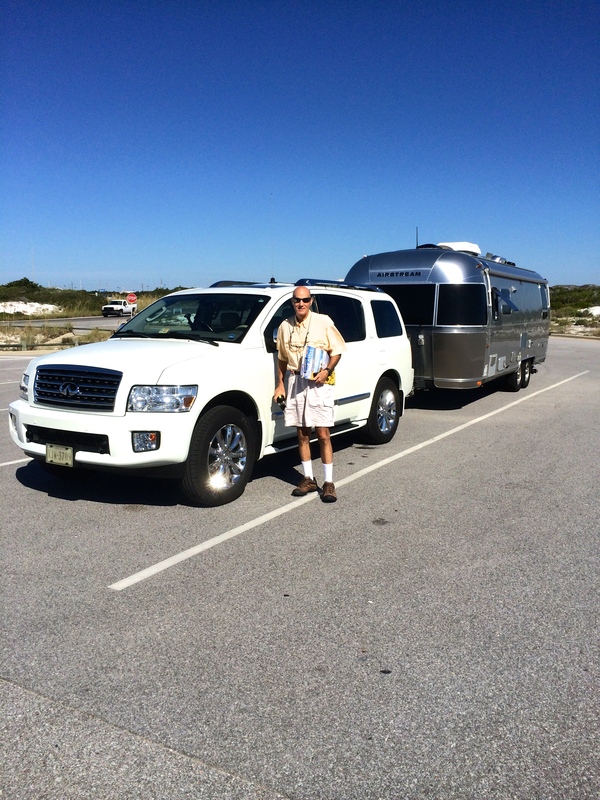 This is one reason that we love RV’ing, there is no place to stay at Fort Pickens other than the camp ground. Some of the most beautiful places that we have seen in America you had to camp in because there was no where else to stay. We began RV’ing to see America; unexpectedly we discovered something that is equally as gratifying. We discovered interesting and kind people along the way. We don’t totally understand it but RV’ers all seem to be exceptionally nice. We weren’t around in the simpler early 1900’s when neighbors helped neighbors and people sat on their front porches and spoke with one another but that is what RV’ers do. 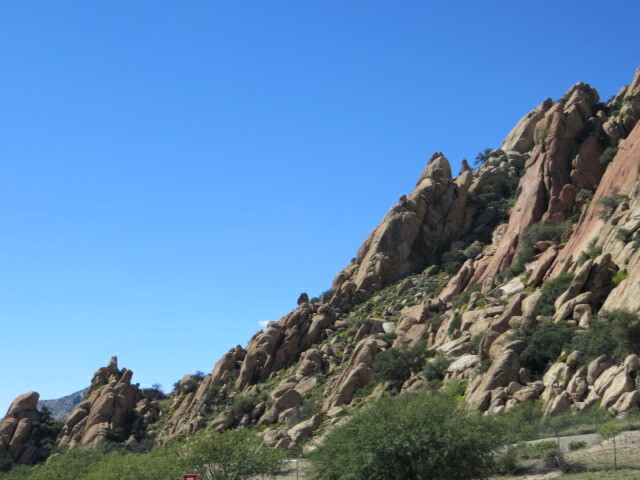 Many of the best places that we have seen were suggested by RV’ers heading in the direction that we just came from telling us about things that we should see where they have been. Last week we were next to a couple, Jim and Dorothy from Oklahoma. Jim gave us driving lessons on how to back up, he could back up the way a professional seamstress threads a needle. Jim and his wife asked us in to their 5th wheel after just meeting us and could not have been nicer. He helped us but we still need lots of practice. We could go on for pages about the nice and interesting people whom we’ve met but until you experience it yourself it doesn’t compute. This is as gratifying to us as the sites that we see. America is a beautiful country and it is full of kind and wonderful people! We left Fort Pickens National Park, Friday for Ocean Springs, Mississippi where Roberta’s great great grandfather lived. We arrived at Indian Point RV Park in the early afternoon and checked in, the campground was disappointing, but that doesn’t matter much when you have your accommodations with you. 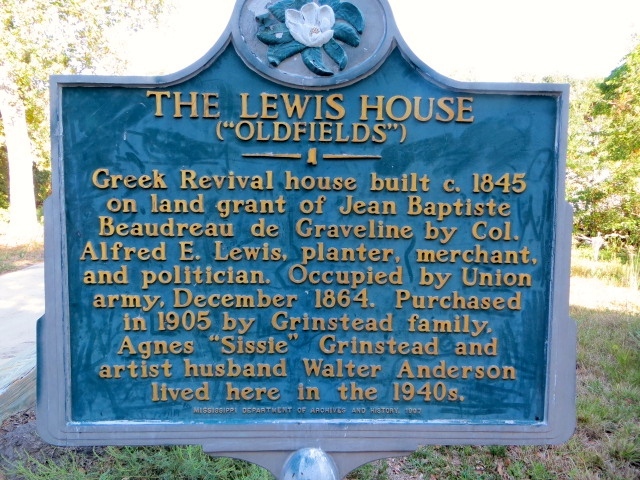 After hooking up we set out to find Roberta’s great great grandfather’s home, The Lewis House. We found it with very little trouble. 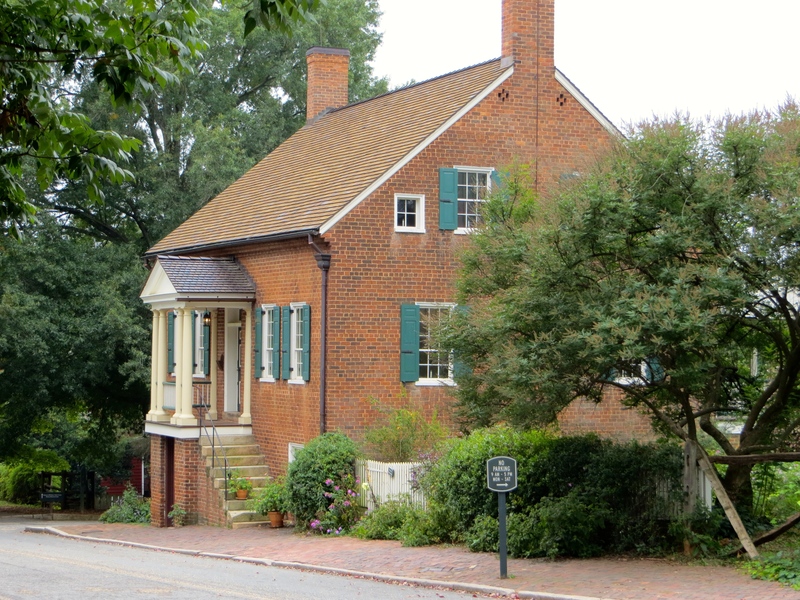 The Lewis House was later renamed Oldfields. 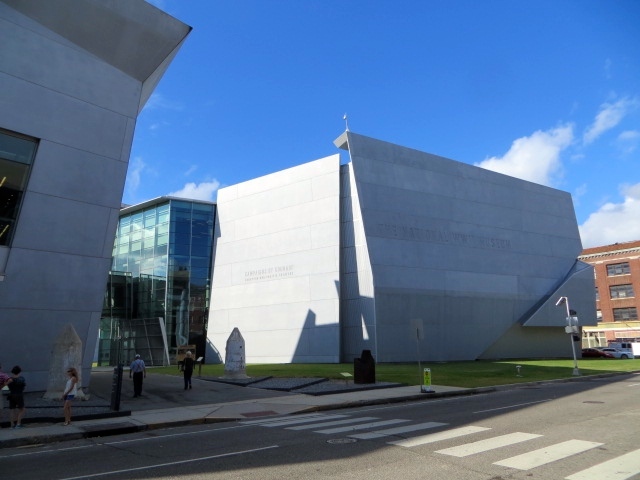 It fronts directly on the Gulf of Mexico; a beautiful setting, but it was badly damaged by hurricane Katrina. 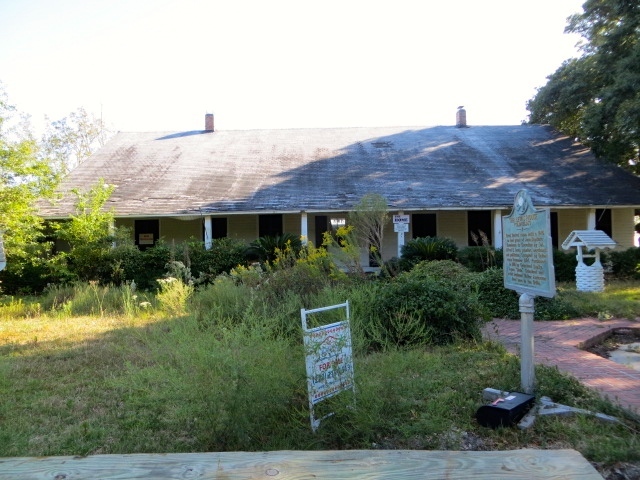 Oldfields, built circa 1845, is on the Historic Register and is on the top ten lists of endangered houses in Mississippi. A.E. 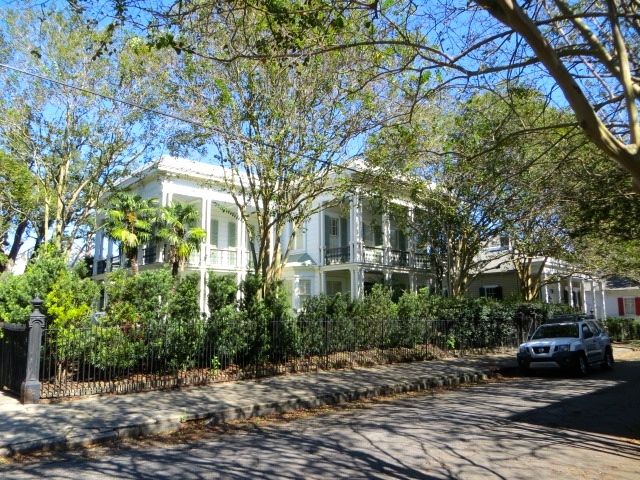 Lewis who was a planter, merchant, politician, and signor of the Mississippi Secession built the home. Roberta spoke with a relative who said that the title to the property is in dispute, for some reason, and until that is settled no one will purchase it and fix it up. 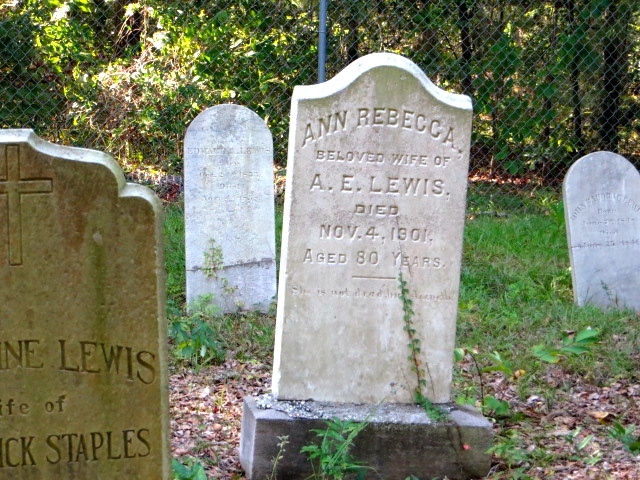 Roberta visited the house as a child with her parents but only has only vague memories of the house and the graveyard, which survived the hurricane. 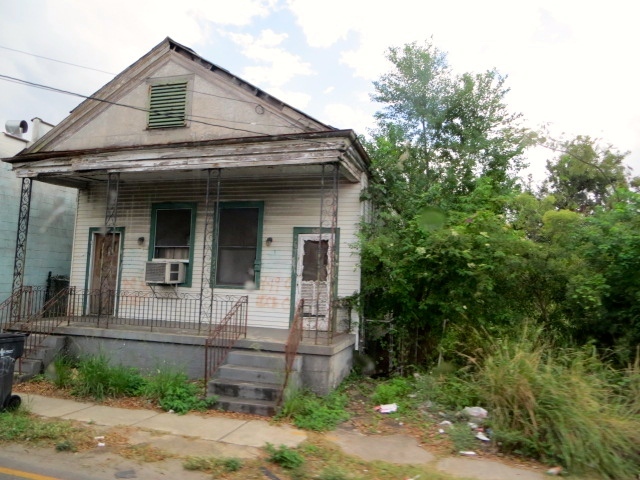 Hopefully the title problem will be solved and someone will purchase and restore the home. 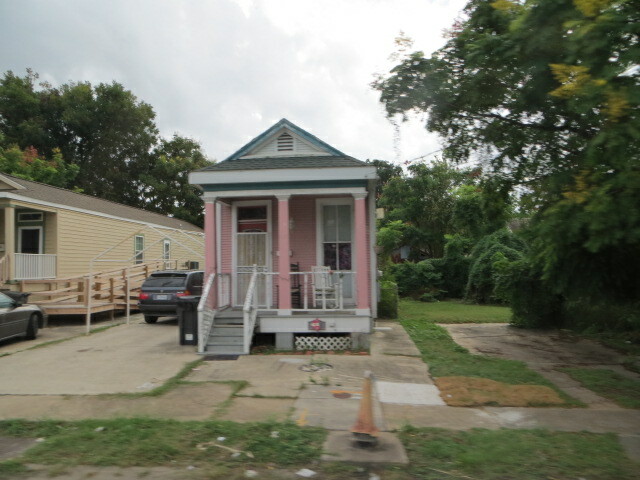 Through out the Gulf Coast we have seen homes that were damaged by Katrina that have not been restored. We were told that in some cases it is due to not having had flood insurance, in other cases the owners are still fighting with insurance companies over whether damage was caused by wind or flood. Most insurance policies don’t cover floods. We also had an opportunity to drive down a lane in OS called, Lovers Lane, where Roberta’s grand mother lived as a child. 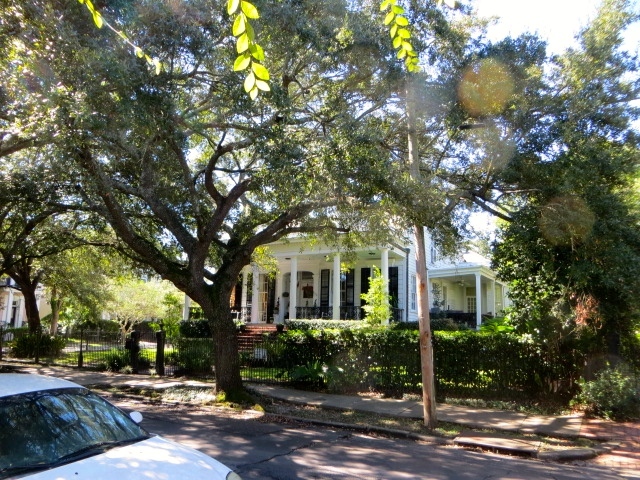 The road was beautiful and fronted the Gulf of Mexico with beautiful old houses and grounds set back from the road. We discovered when we called for reservations that most of the RV Parks around Ocean Springs ( OS ) were full. 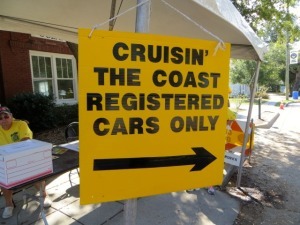 When we asked what was going on we were told that this weekend was Cruising The Coast, a fall festival for antique and unique cars. Saturday morning we drove into OS to visit The Walter Andersen Art Museum. 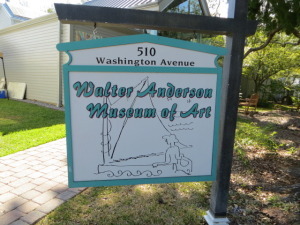 We visited The Walter Andersen Art Museum because in reading the history of The Lewis House (TLH) we discovered that it was purchased in the early nineteenth century by the Grinstead family, whose daughter and son in-law came to live with them at TLH. The son in-law was Walter Andersen who became a famous artist, due to his association with the house we decided to visit the museum. Walter Andersen was eccentric; no really he was mentally ill. He would leave his family for weeks at a time and row off shore in a skiff to a deserted barrier island by himself. He was unstable but he expressed himself through his art. After his death his widow discovered a locked room full of paintings and drawings that no one knew about. 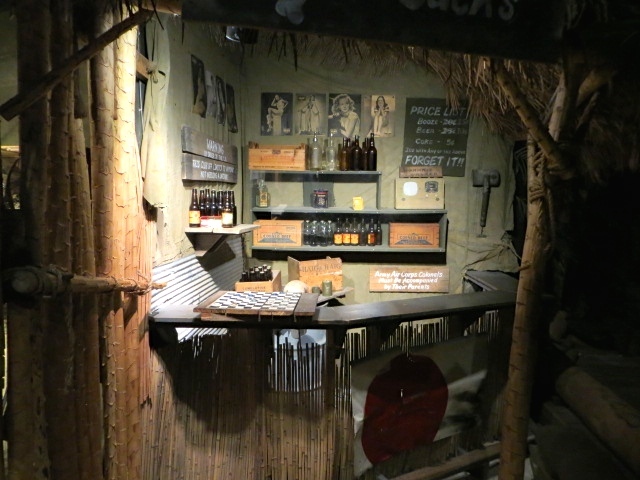 The museum is quite large and it is devoted entirely to his work. 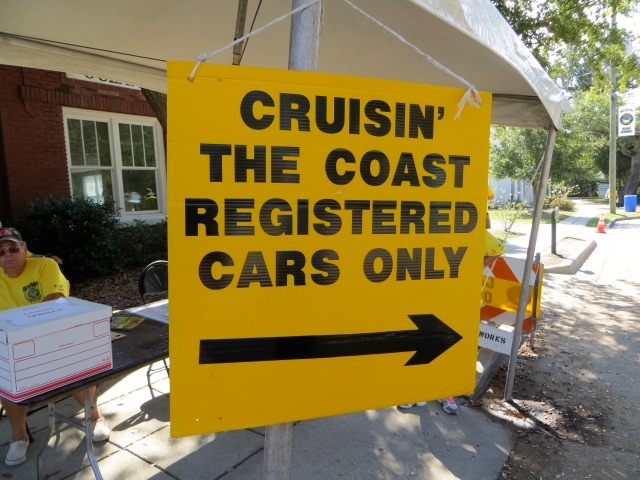 When we arrived in Ocean Springs we had no idea how big “Cruisin The Coast” was, all we knew was that there was a festival going on that weekend. 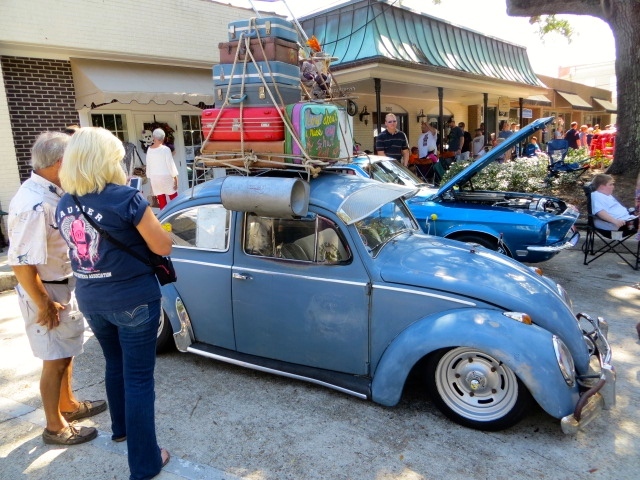 We discovered that 7,000 cars from all over the U.S. were entered in the festival this year. In addition to the entrants they expected over 37,000 people to attend the event. We aren’t into cars, but after going through the museum we got caught up in the festivities. We walked around Ocean Springs looking at both cars and people, we’re glad that we did. 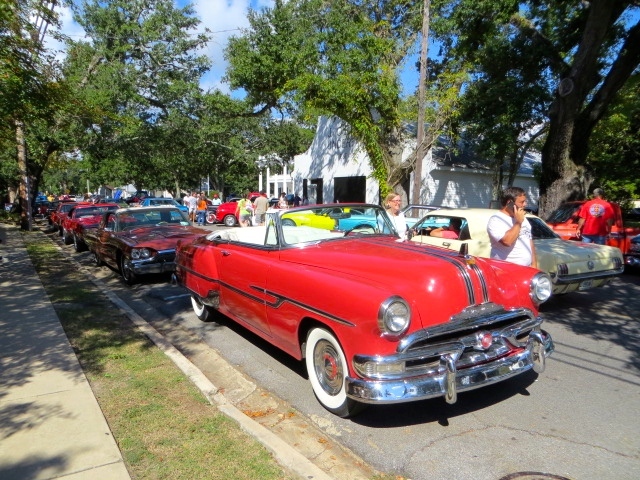 The cars were fun and the festive atmosphere was contagious; all in all a nice day. Ocean Springs is a cute southern Mississippi town, with a beautiful downtown. Main Street is lined with large Live Oaks that we love. The weather has been unusually hot, actually setting records, so we appreciate the shade that the canopy of these trees provided. We left Ocean Springs early headed for The Big Easy. 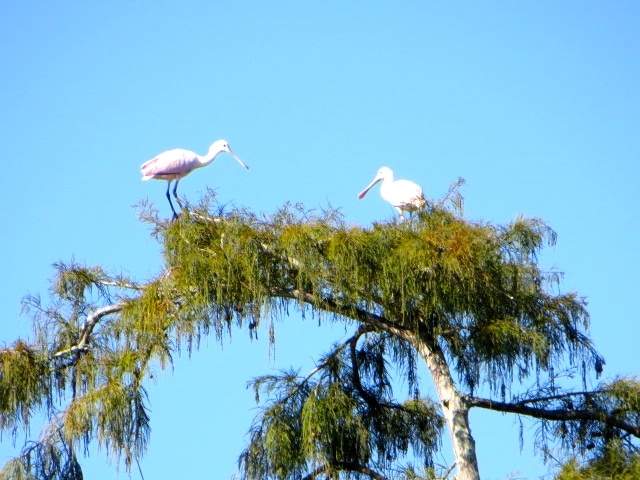 We had reservations at The French Quarter RV Resort; when you hear resort after the name of an RV park think expensive. 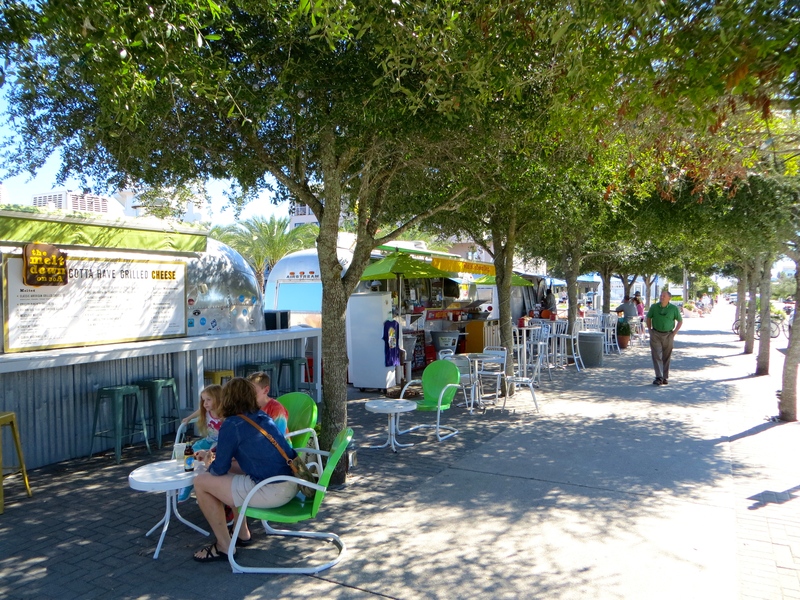 It does not necessarily mean nice, and often RV parks in downtown areas are not nice, they are just convenient. 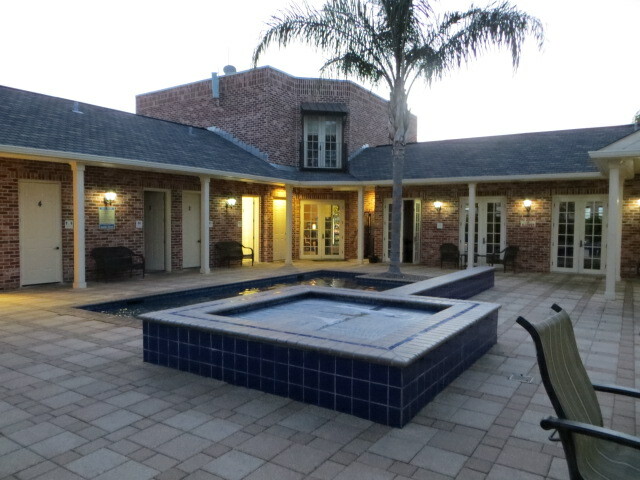 The French Quarter RV Resort is both nice and well located near the French Quarter, nice facilities including hot tub, pool, exercise room, and nice people. We met several interesting couples staying in the park. One of the ways that we find out what to do in an area is by asking other people staying at the park. What they have done and what they liked. We got wonderful advice form our friend Jay Bourgeois, who lives in Charlottesville and New Orleans. 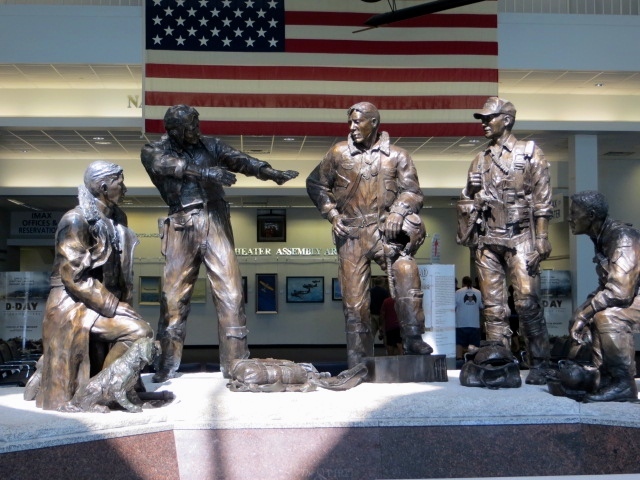 Monday morning we went to the WW II Museum, which we will remember as one of the highlights of both our trip west and our stay in New Orleans. It qualifies as a VSP (Very Special Place). The museum is huge and easy to spent an entire day looking at all the exhibits. We focused on seeing a film called “Beyond All Boundaries”. The film was a history of WWII, narrated by Tom Hanks with lots of special effects. We both left thinking that every high school and college student should see this film to learn the lengths countries will go to win a war, both good and bad. Monday afternoon we took a Grey Line Tour that highlighted the devastation done by hurricane Katrina. The tour took us through Ward 9. We learned that over 80% of the City was under water and that most of the problems were caused by the levy breaking with no way to get the water out of the streets. The City had no electricity, no generators, phone connections etc., plus no plan for where the citizens could go. The tour guide told us that in some sections people had less than five minuets to evacuate their homes. When they got out they started moving downtown to find safe buildings to get into, but they all had water damage. The police stations, fire stations, hospitals, and all of the schools were flooded leaving the coliseum as the only place that was dry. The City is still recovering with torn up streets and whole neighborhoods that were flooded with water to the second floors. 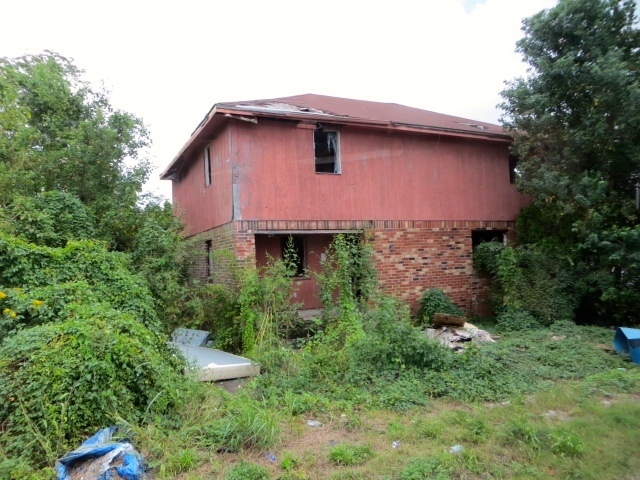 There are still many abandoned lots and homes waiting to be claimed and in many cases owners are still fighting with the insurance companies. We did see new homes built by Brad Pitt and a Musicians Neighborhood being re- built but there is still a lot of work to be done. 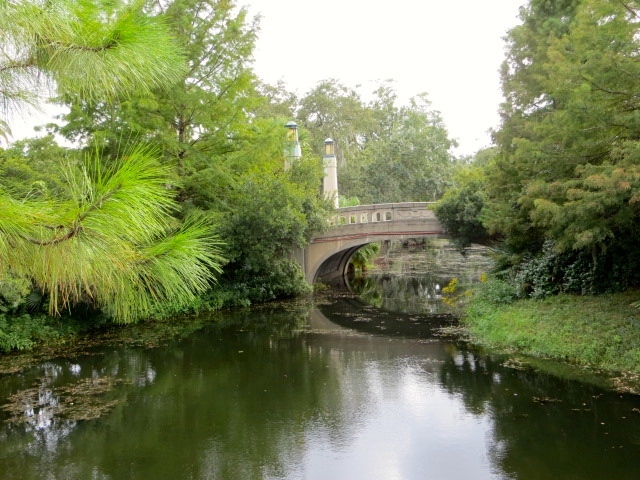 We stopped in City Park, one of the largest parks in the U.S.; it was designed by the Olmstead brothers who designed Central Park, The Biltmore in Asheville and other well known parks. 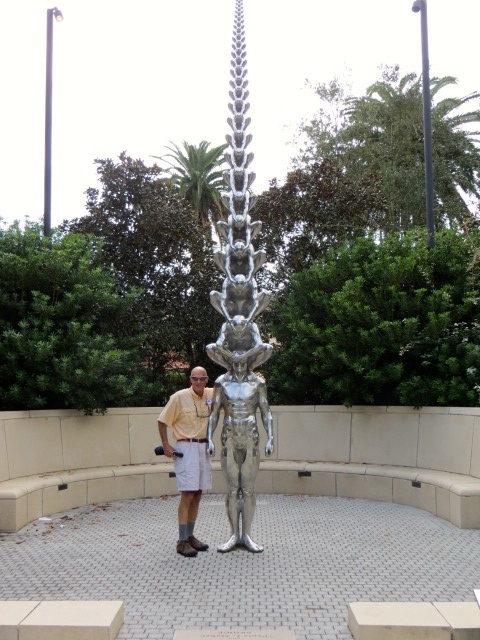 We walked through the Besthoff Sculpture Garden it was fantastic! It was also interesting learning about how the levies, Lake Pontchartrain, the pumping system and the part that each of these played in the Katrina catastrophe. 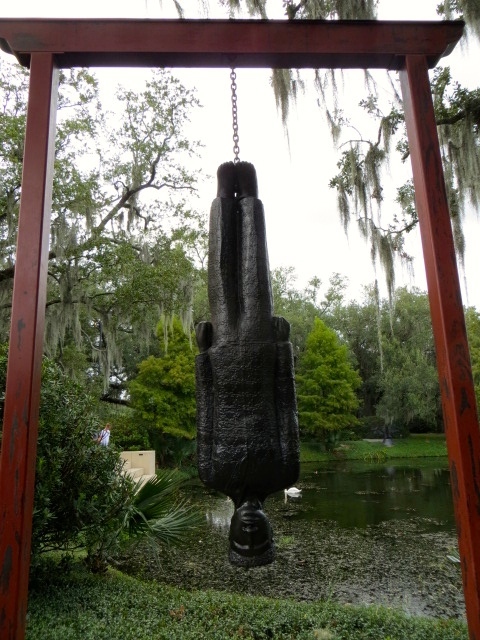 Besthoff Sculpture Garden – Fantastic! No Comment! Use Your Artistic Mind To Make Your Own Caption. We finished off a nice day strolling through The French Quarter on the way back to the RV park. 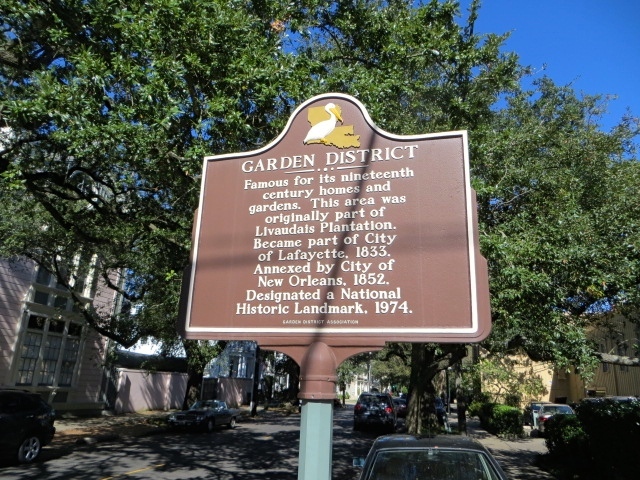 Tuesday we walked through The French Quarter and got on an old refurbished Street Car riding out to The Garden District where we took a three hour walking tour. After the WW II Museum the walking tour of the Garden District won second place as our favorite thing. The tour guide was excellent, she was a retired teacher and she knew interesting facts about the area and she kept our interest. 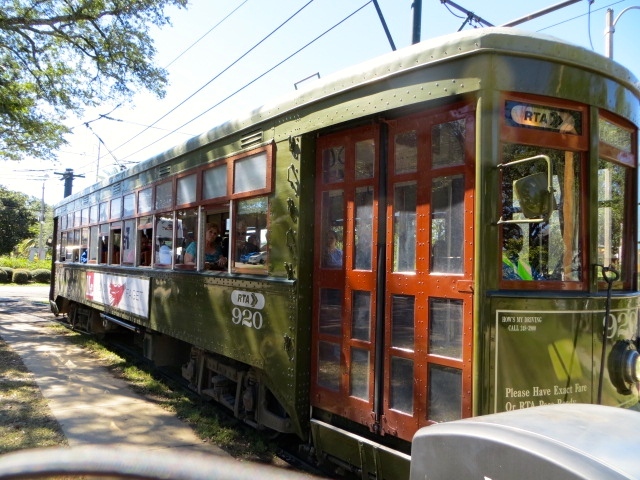 The street car ride out and back was fun as well; the street cars are national historic landmarks they are original and have been refurbished, which made for a fun ride. We rode the streetcar to the end of the line seeing Tulane, and Loyola University. 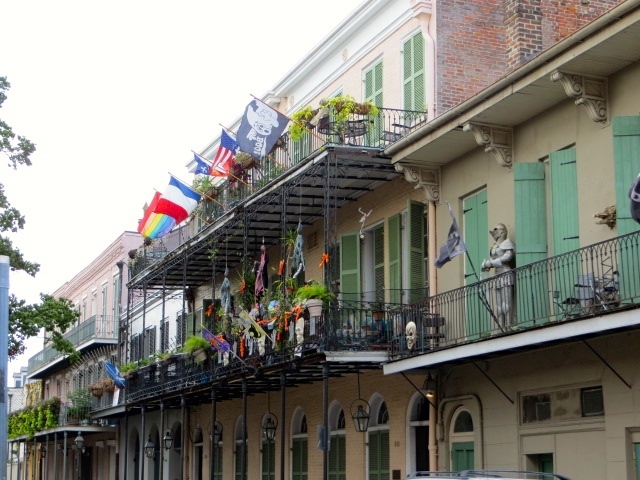 We walked through the French Quarter again on the way back to The Turtle. 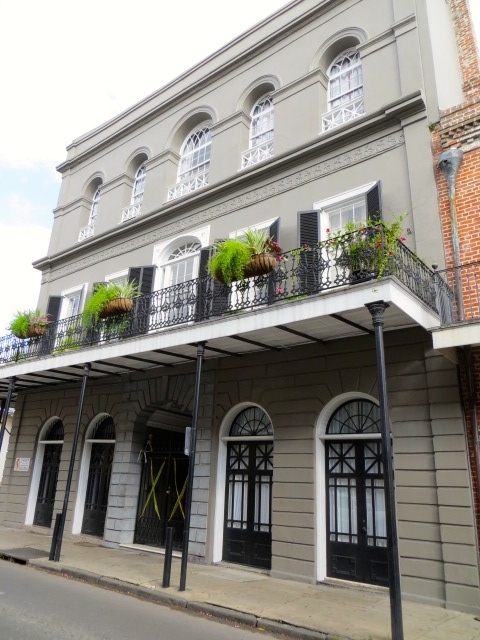 Commanders Palace Restaurant – Most Famous Restaurant In New Orleans. 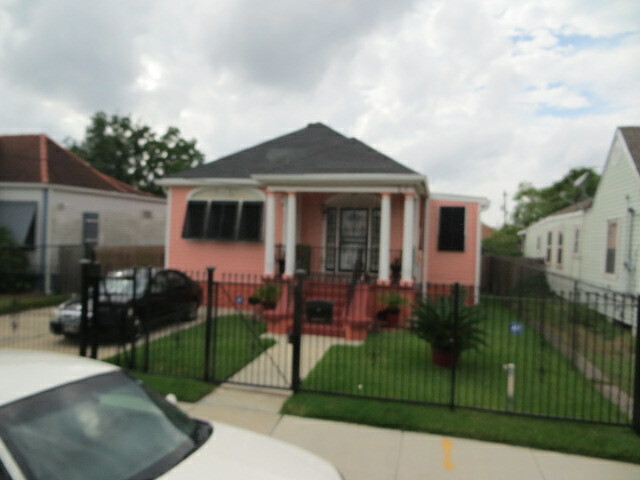 New Roof Since Katrina. Wonderful Architecture & History. 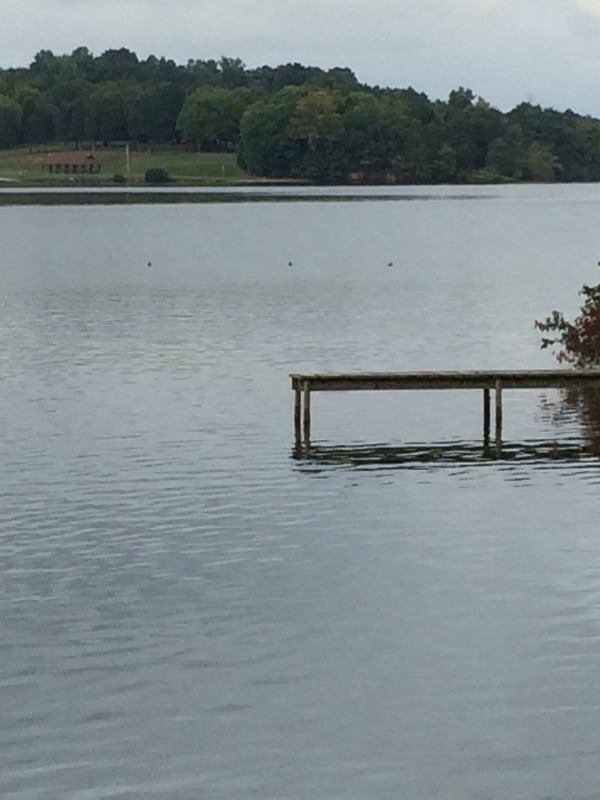 No Flooding In Most Of The Area. 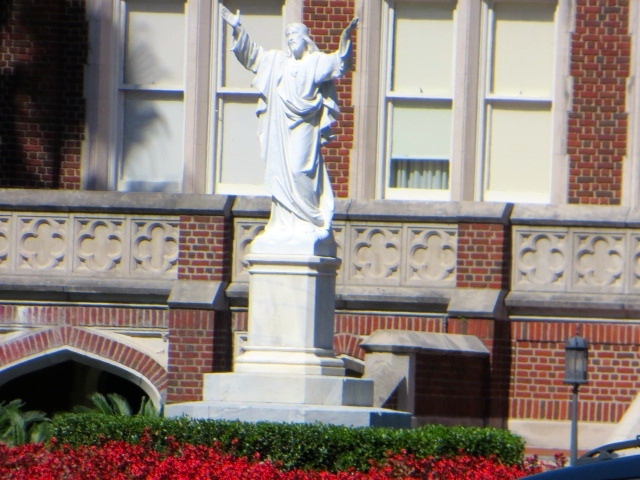 Statute In Loyola University Court Yard. The Quote From A Friend Is : ” Thank God there Is A great University Next Door” Refers To Tulane Which Is Right Next Door. 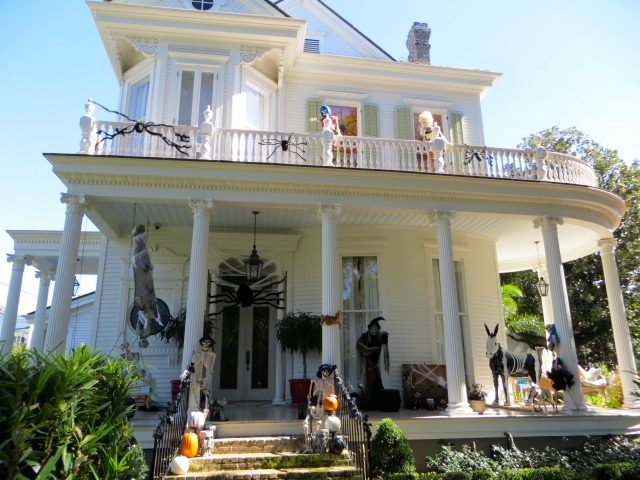 Halloween Is A Big Deal In New Orleans! Grave Yard Condos. The City Is In Charge And Is Not Doing Any Up Keep. Many Graves Date To 1830 to Today. We ended the day at yes, Whole Foods, where we bought dinner and took it back to the RV. Tired after a day of sight seeing Eddie went to the hot tube to relax on a cool moon lit evening. 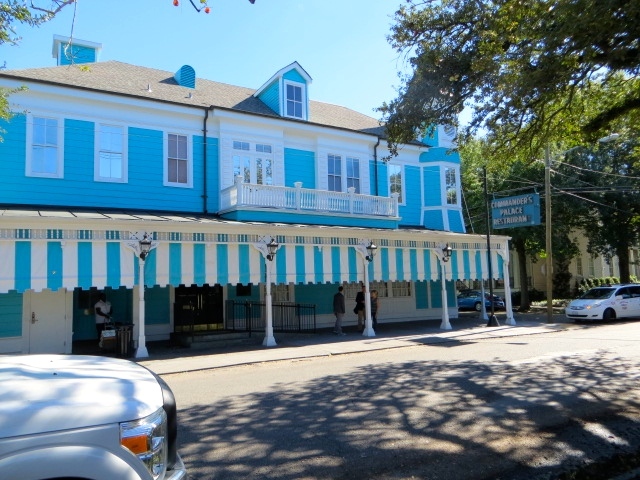 We love New Orleans and The French Quarter RV Resort was a fantastic location! 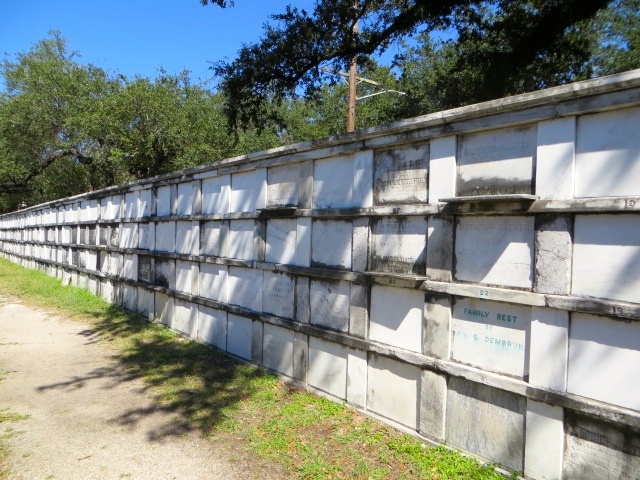 Wednesday we left New Orleans and drove to Breaux Bridge, LA about 150 miles west. Relaxing After A Long Day! 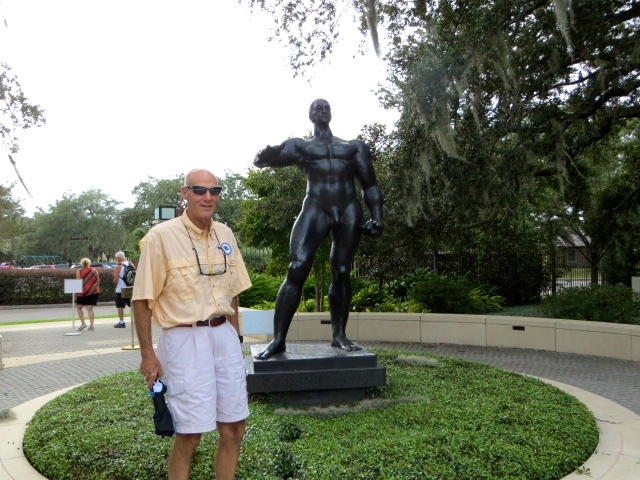 We left New Orleans Wednesday morning after spending a wonderful few days having fun in a fun city and in a fancy RV Resort. 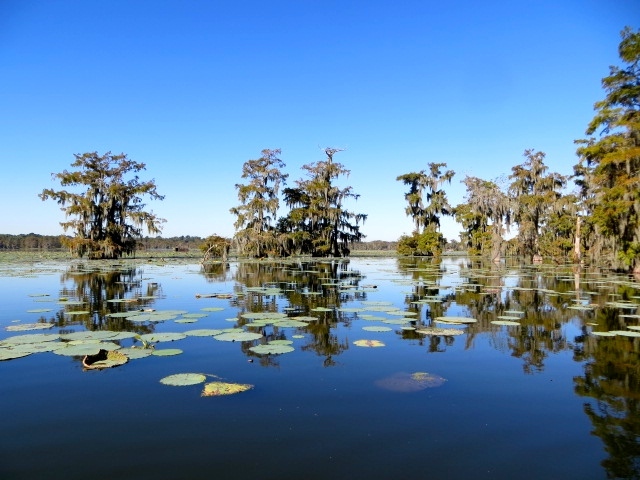 We were headed to Breaux Bridge where we had rervations for a swamp tour. 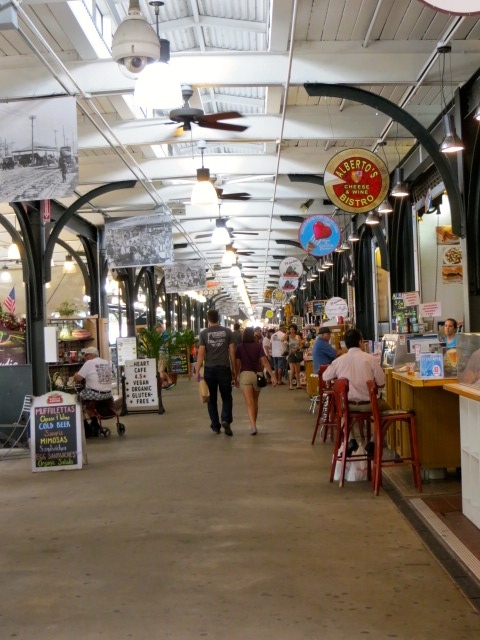 The RV site in Breaux Bridge was OK but we’d been spoiled with hot tubs, walking to The French Quarter, Whole Foods etc. It doesn’t matter though because we tow our home along with us and it is clean and comfortable no matter where it’s parked. 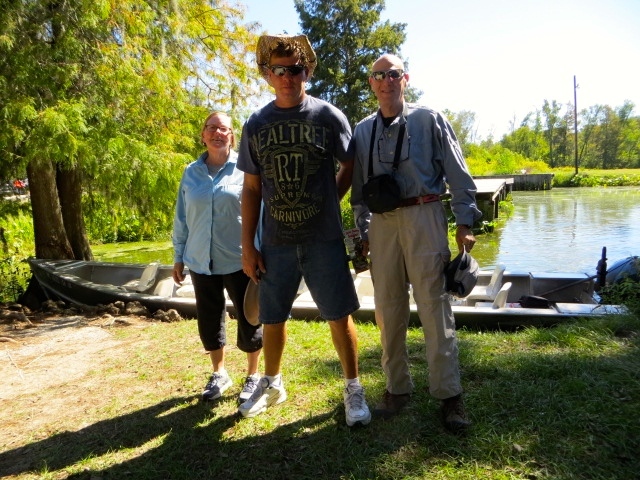 We met the tour guide from Cajun Country Swamp Tours early Thursday morning at the boat landing. We had been told that there were porta potties where we got onto the boat and to use them because once the tour starts there was no place to go. 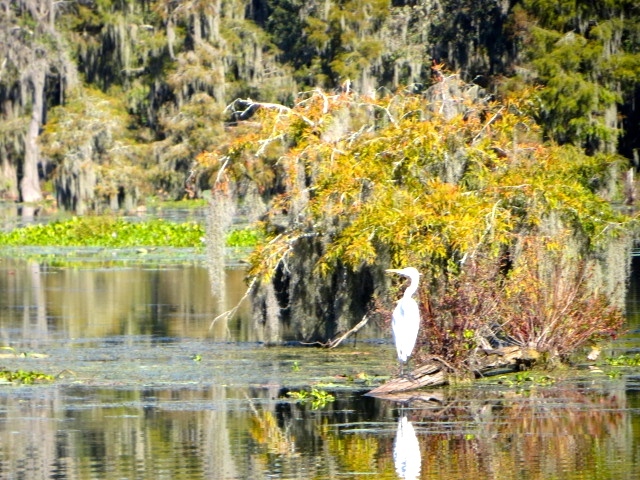 The swamp tour was another highlight the scenery was beautiful and the guide did an excellent job. Another VSP! Our tour guide, Shawn, was excellent. 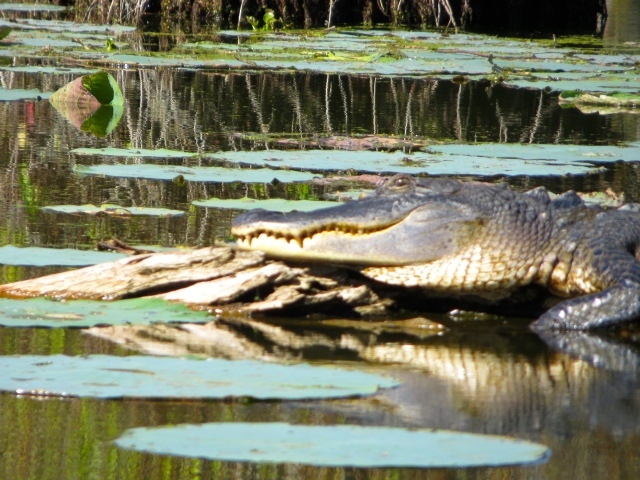 He had a strong Cajun accent and he had grown up hunting on the swamp his whole life. 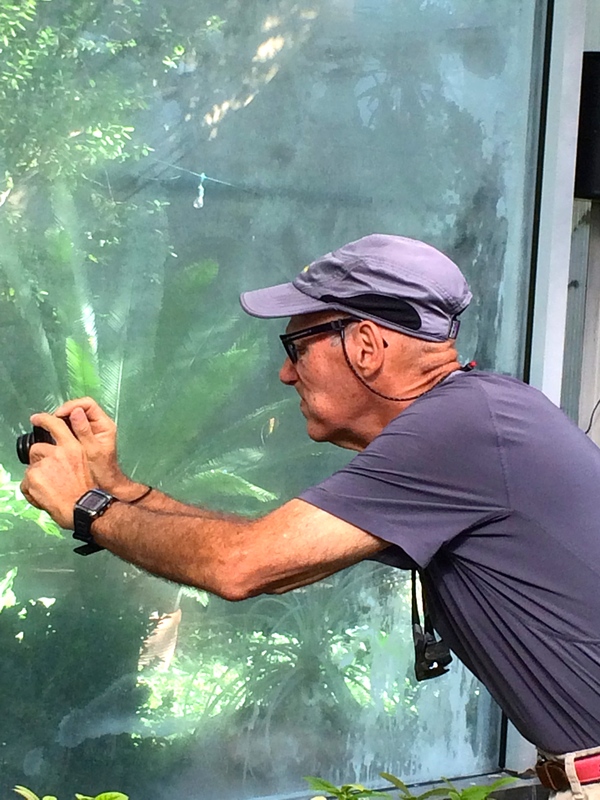 He had a degree in biology and he knew the birds, plants and animals well and spotted them way before any of us. It was a crystal clear day and we could tell that it was going to be hot so we wore long pants, long sleeve shirts, hats and sunscreen. 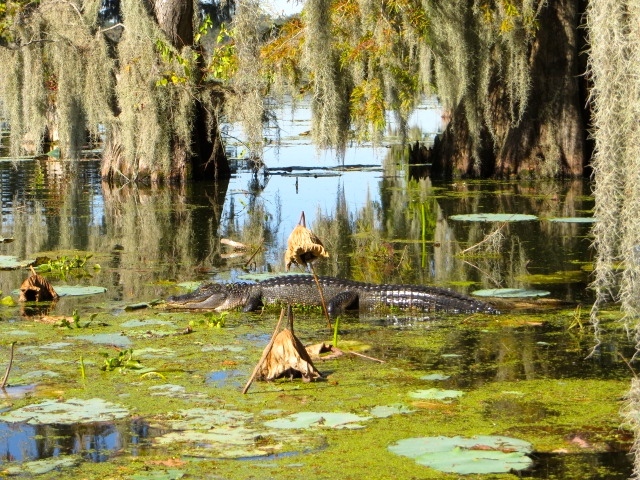 There were seventeen of us on the tour; what everyone hopes to see on these tours are alligators. We saw our first “gator” within ten minutes of leaving the dock. 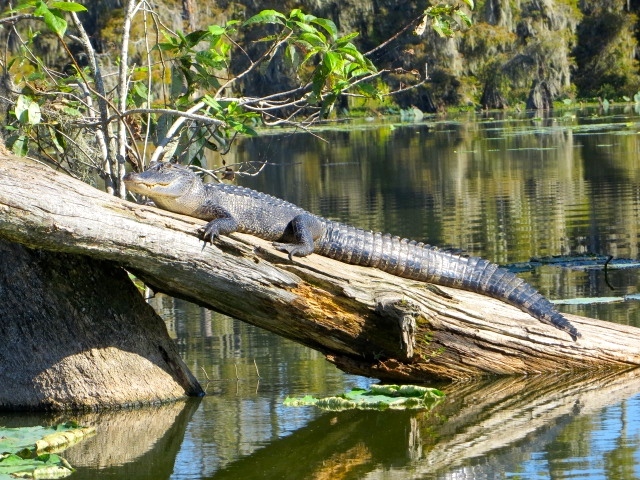 We saw so many of them that we became tired of gators by the end of the tour. We’re not “birders” so we can’t remember the names of most of the birds that we saw but they were beautiful. The only name that we remember is the bald eagle that we were lucky enough to see, it was perched in a tree and then took off in flight. Roberta was worried about vicious snakes dropping into the boat, but there were no sightings. Shawn told us that the birds and the gators took care of the snakes for Roberta. 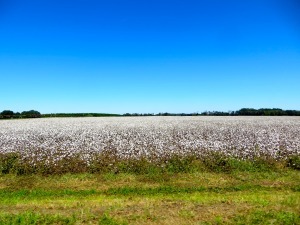 We had not decided whether to spend another night in Breaux Bridge or not; but when the tour was over there wasn’t anything else that we wanted to do so we decided to move on. It was mid afternoon by the time we left and we weren’t sure where we would spend the night. Our next destination was Austin but we knew that we would not be able to get there Thursday. 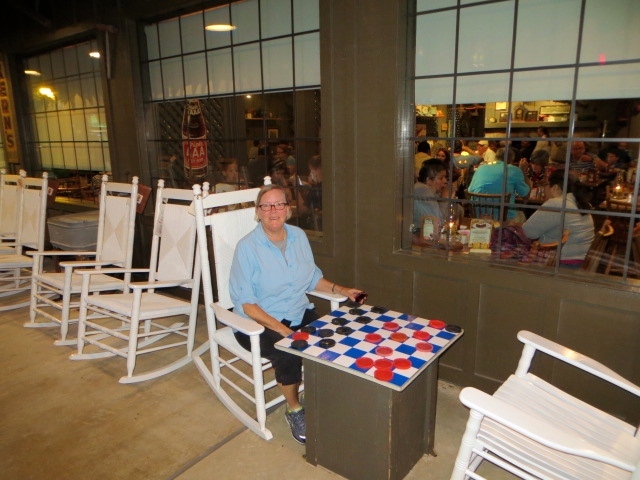 We spent Thursday night in a parking lot at a Cracker Barrel restaurant outside of Houston, where we had a nice dinner. We just discovered Cracker Barrels, they are kind to RV’ers, and they have RV spaces in their parking lots so you can spend the night. The location was great so after dinner we took a walk where Eddie found a Walgreens and got his flu shot while Roberta did walking laps around the parking lot. The Crackle Barrel manager was so friendly that after closing time he came over to talk to Eddie and wanted to see the inside of the Turtle. No problem except Roberta was in bed reading the latest Tom Clancey novel, and wasn’t prepared for tours. Nice when you are in route and don’t want to be far off of the main road. We got up early and arrive in Austin at about noon. People are always stopping us to ask about the Turtle. We stopped for gas and a lady was so excited she kept us at the gas pump talking to Eddie until….yes she got a look at the inside! Just when we were ready to leave another woman came up to Roberta and wanted to know about the Turtle and what kind of car we had etc. 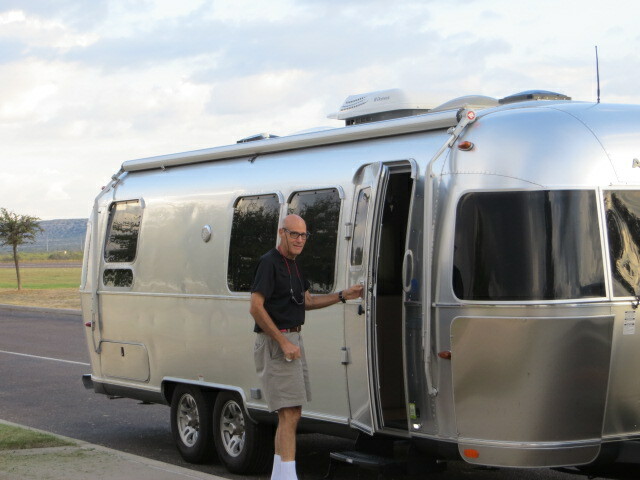 The Airstream attracts a lot of attention, and we’re glad that we made the decided to purchase it over other makes. 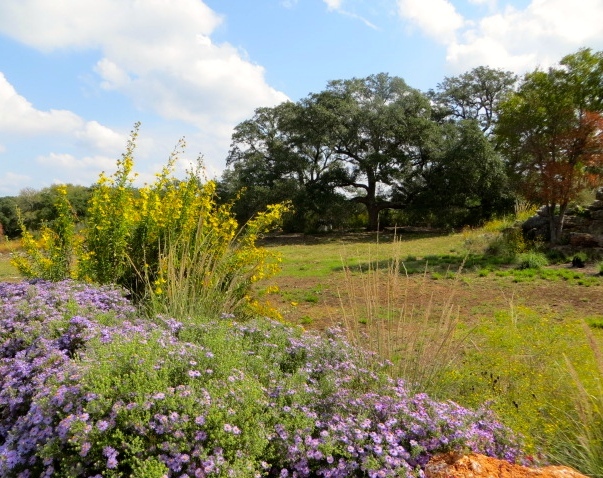 We arrived in Austin, TX Friday afternoon and stayed at La Hacienda RV Park. We love to visit National Parks and Presidential Libraries. We’ve been to the LBJ Ranch but we had never been to Austin and decided now was a good time to go. Saturday morning we drove into Austin using our GPS to get to the Johnson Library; that was a mistake. 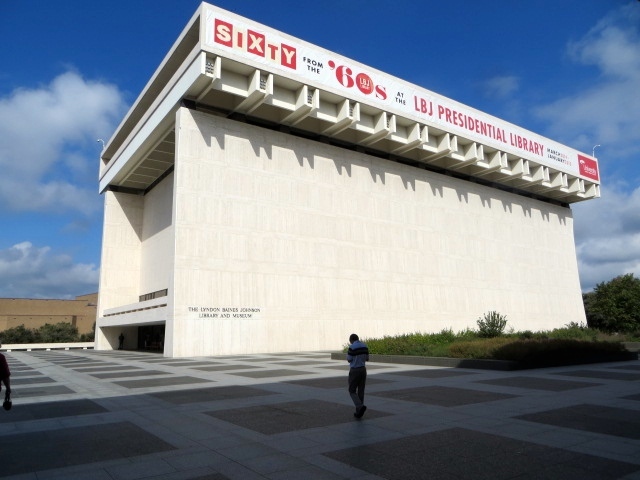 Saturday was a home football game at The University of Texas and the LBJ Library is adjacent to the stadium. The GPS kept taking us to streets that were closed because of the football game. We’ve heard it said that in Texas football is like a religion, we don’t know whether that’s true or not but we know now that it’s taken very seriously. The Saturday game was a night game which started at 7:30; we got to the LBJ library at about 10:00 AM, and the tailgating was already well underway. The stadium holds 106,000 people and we were told that it is full every game. We finally did get to the LBJ Library and just like the other presidential libraries that we have visited this one was excellent. President Johnson was a polished politician who knew how to work the political system and get things done. A tremendous number of bills were passed while he was in office. He worked the phones like a true salesman and got the votes that he needed to pass legislation that was important to him; he would however compromise if he had to get things done. He was devastated that he could not end the war in Vietnam. 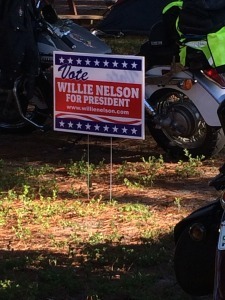 Being unable to get us out of Vietnam and due to his health he decided not to seek reelection in 1968. 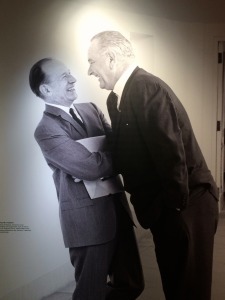 He is known for the passing of the civil rights act of 1964 however he and Lady Bird did more to create nationally protected lands and parks than almost any other president. Lady Bird was really the environmentalist in the family in addition to having a keen business mind. 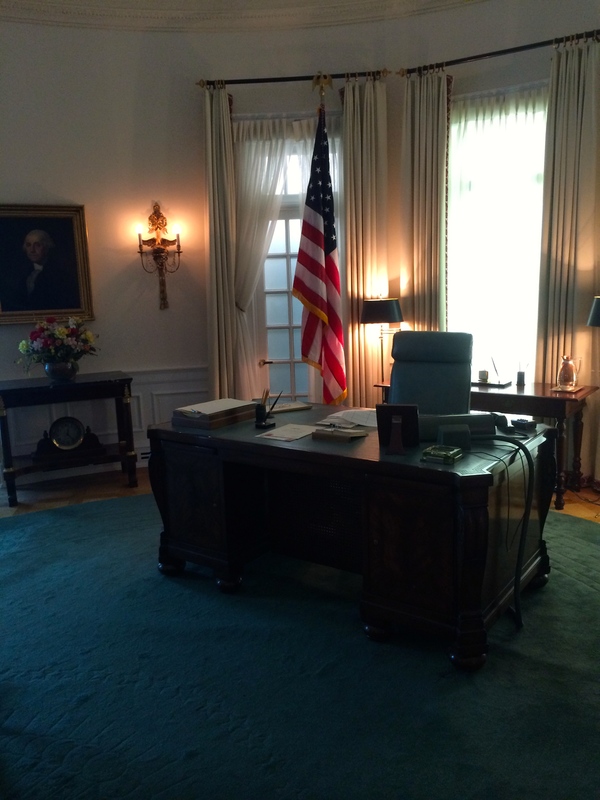 LBJ Desk In The Oval Office. One Of The Few Presidents That Brought His Own Desk With Him. On our way back to our RV we went to a Whole Foods store that is the biggest and nicest WF store that we have seen. We were told that it is the original Whole Foods and is the flag ship store, doing over a $100 million in sales a year! We stocked up with healthy food and headed home to The Turtle. In addition to seeing beautiful and fun places we love meeting interesting people along the way. 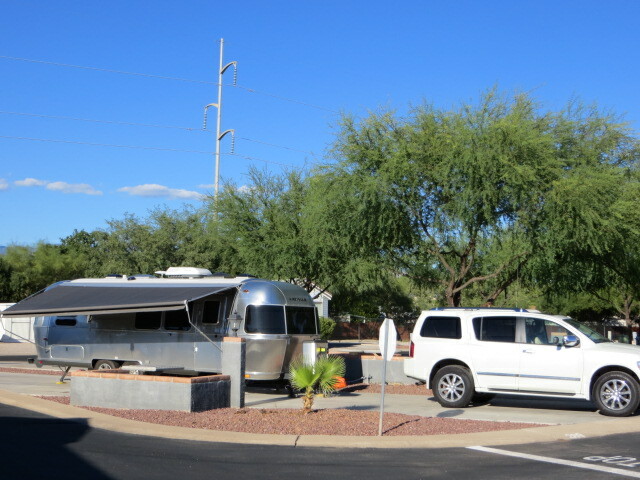 We saw an Airstream parked close by at La Hacienda so of course we had to talk to the owners. They were a nice middle age couple from California and had sold their home two years ago. Since selling their home they have been traveling around the country. The two of them and two large dogs were in a twenty-five foot Airstream. They were on their way to San Antonio to look at houses. We have met several other couples that are “full timers”, some are retired others are still working. 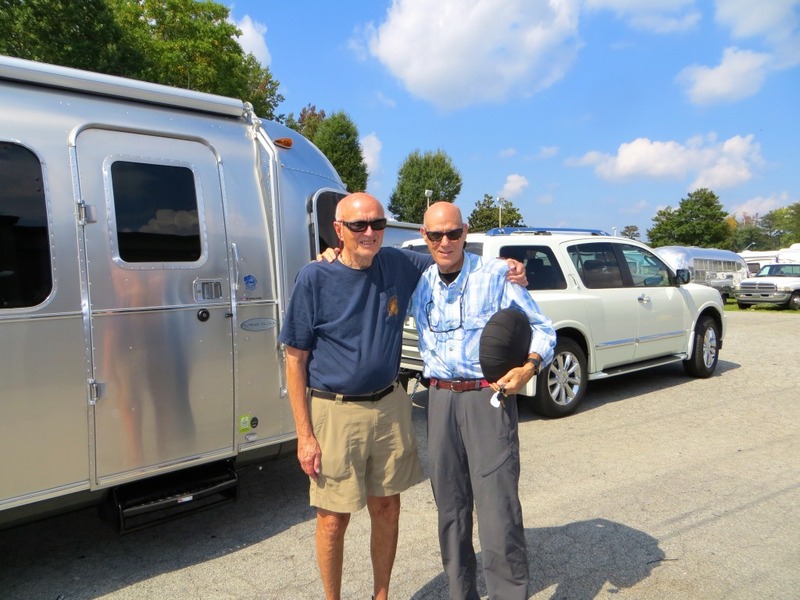 We met another couple in an Airstream from Kansas they had sold their home a year ago and been living in their Airstream waiting for a transfer. The husband worked at Coke Cola and the wife as a manager of Fred Myers Jewelry Store (owned by Kroger). 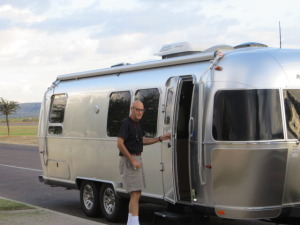 They were moving to Tucson and going to live in their Airstream at least for a year until they figured out where they wanted to buy a home. People who live full time in their RV’s are called “Full Timers” and it is surprising how many of them there are. They are interesting to talk to and are usually very interesting people. 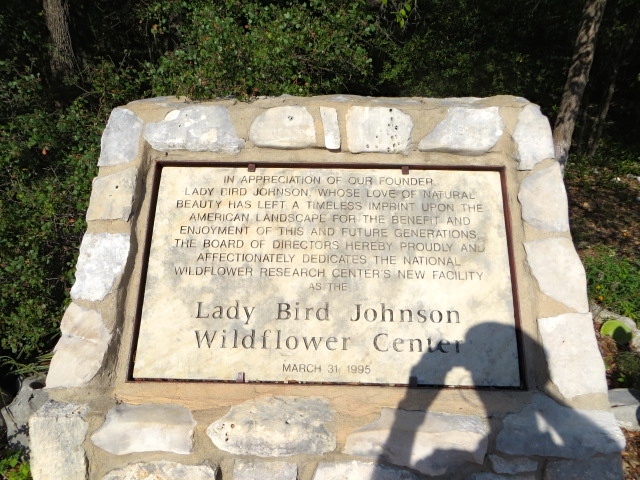 Before leaving Austin we went to the Lady Bird Johnson Wildlife Center. 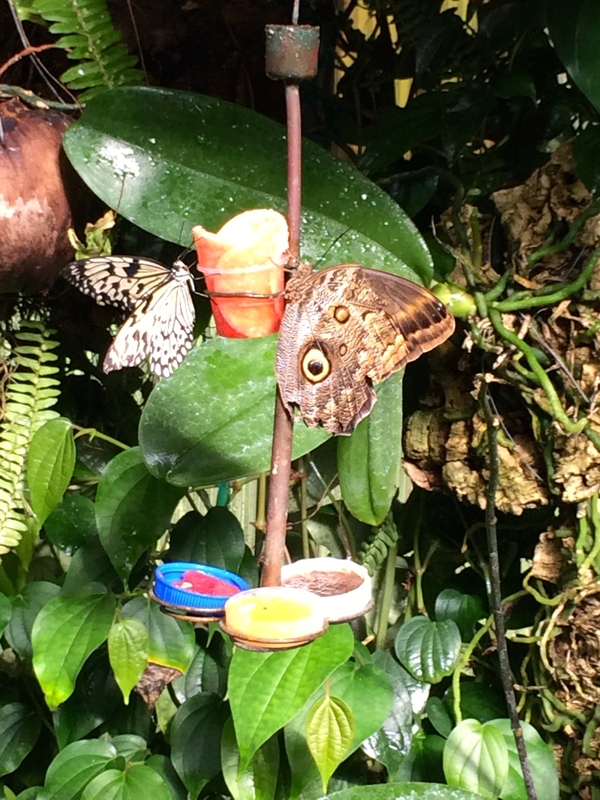 We started on a tour but quickly realized that we were with people out of our league! The tour guide was very knowledgeable but the other people on the tour got very bogged down on grass…….and not the kind you smoke! There was a lengthy discussion of different seeds, grass height, grass mixes etc., way above our pay grade, so we wandered off on our own to view the various gardens. We learned a lot about Lady Bird who was smart, educated, and passionate about our national parks and the preservation of our lands. She was also a very astute business woman who at a young age bought a small radio station and grew it into radio, cable, and TV stations that she was actively involved in until her 80″s. 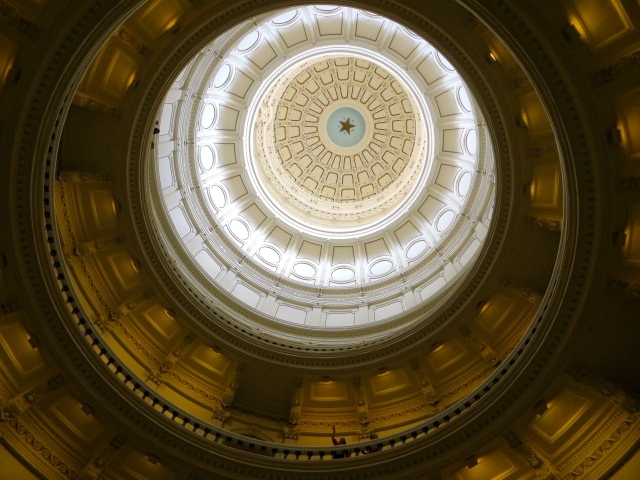 On Sunday, we toured the Texas Capital Building, which was a treat. 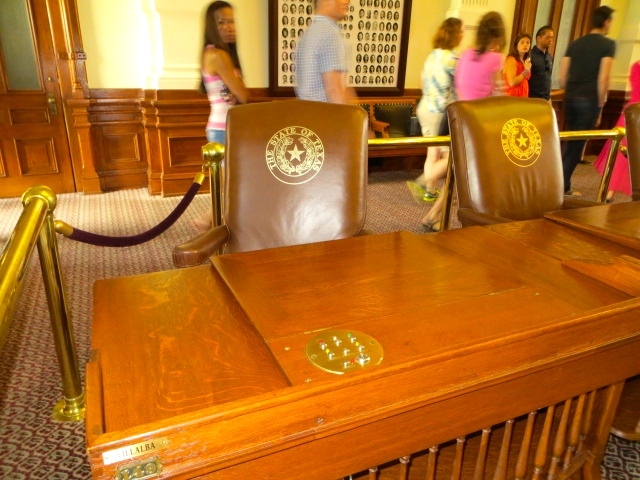 The capital building is beautiful and is in typical Texas Big style! Built in 1888 at a cost of $3.7 million the capital was built out of Texas red granite instead of the more common Texas limestone. The building is beautiful and over the years numerous additions have been added so the building now has over one million square feet of space. 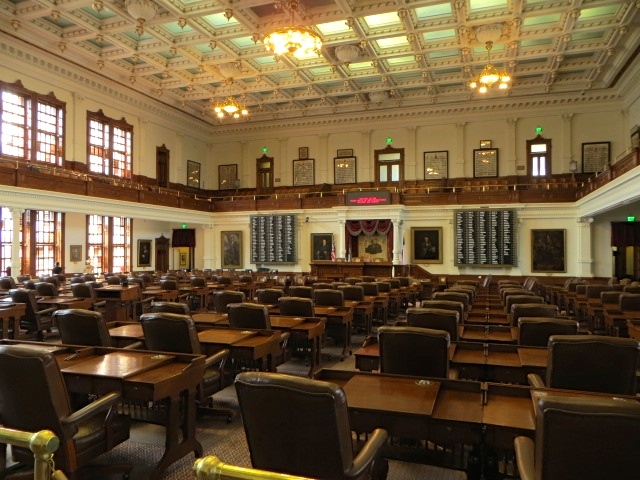 The capital is particularly important because Texas has been under six different flags. 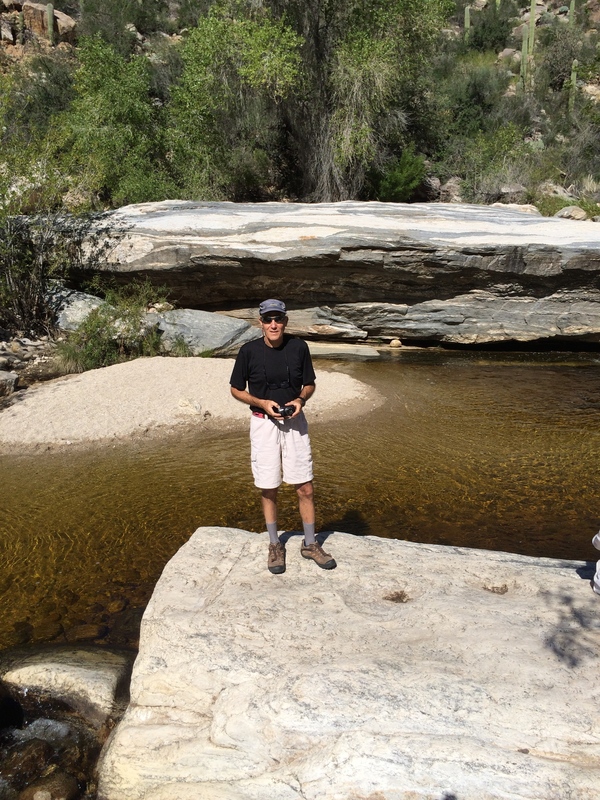 We left Austin Monday morning planning to stop at Fort Davis State Park in Texas. 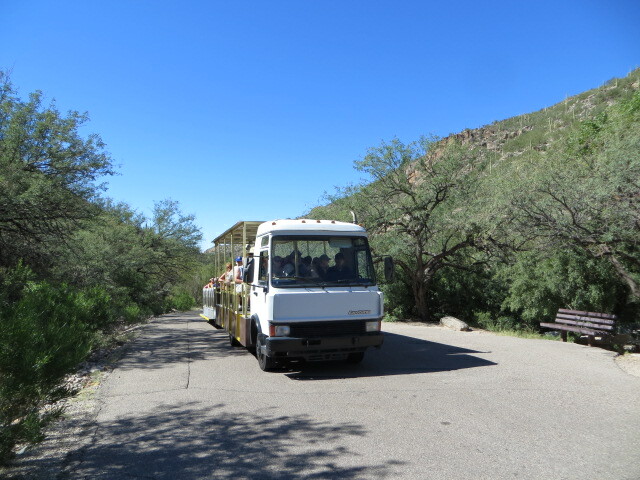 The University of Texas operates McDonald Observatory which is close to Fort Davis State Park and we wanted to visit the observatory. It was cloudy rainy all morning so we called McDonald Observatory to check on the program that we had reservations for; they told us that if it was cloudy that the program would be canceled. Since we were going out of our way to see McDonald Observatory we decided at the last minute to skip it and keep going. That’s the nice thing about having your home with you, you can change your plans on the spur of the moment. In Texas if you decide to keep going you may end up no where, that’s what happened to us. Texas has miles and miles of flat, straight roads. You can drive for miles and miles in Texas and not see a town, we try not to let our gas tank get much below half a tank, in Texas and that’s hard to do. 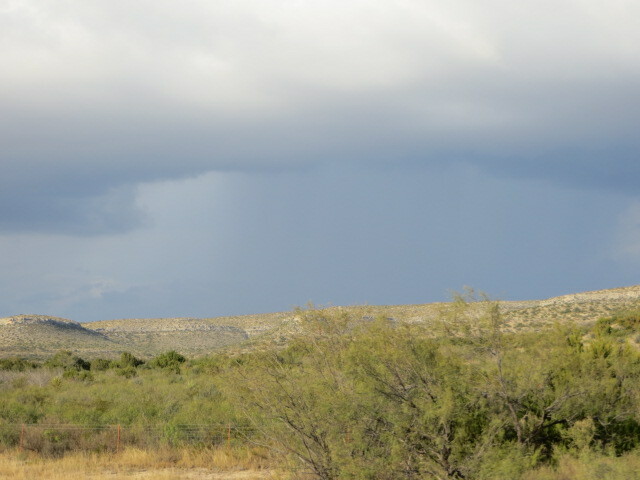 Texas Rain…Only Time It Rained Is When We Showed Up! We ended up spending the night in a rest area at the 309-mile marker in Texas. We had never spent the night in a rest area but the scenery was beautiful and we were tired and did not want to drive any further. We were not close to a town and the rest area was safe and convenient. The only problem with it was that through out the evening eighteen-wheelers kept arriving and parking for the night and they keep their diesel engines running all night. Eddie met the man who took care of the rest stop. He was very nice and told Eddie that Texas leases their rest areas and he worked for the company that leases it. He told Eddie that he used to be an employee but to save money the company made him an independent contractor. He makes $7.50 an hour and works twelve hour days. He paid taxes out of that amount but was able to work seven days a week. He is seventy years old but he told Eddie that the work isn’t very hard and that most employers would not let him work over forty hours a week and he said that he could not make ends meet on just forty hours a week. Exit 309 is in the middle of no where and how this man worked seven days a week and was able to find any services to take care of himself is hard to imagine. Actually exit 309 is in the middle of oil country so most of the labor force in that area is making higher wages and can pay high food and fuel costs. This man we’re sure is one of many who find themselves caught in their later years without any security. 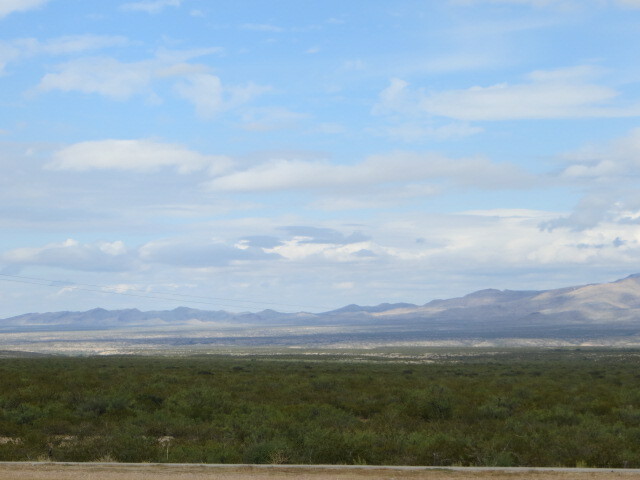 There were no stores, gas stations, or grocery stores for miles. Not Even A Cow Or Oil Well In Sight! 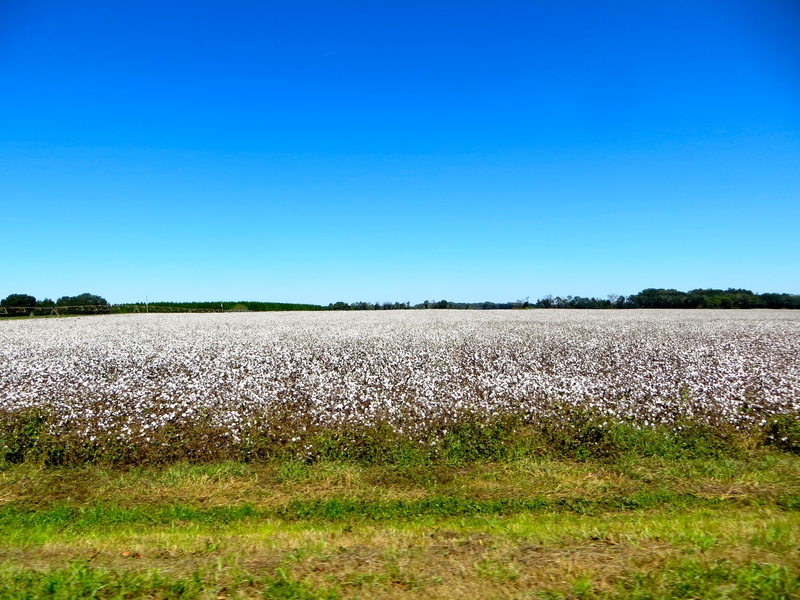 Texas Landscape…..You Drive, Drive, Drive But The Serenity Is Special. We had planned to stay in El Paso the next night; but when we got to El Paso we weren’t tired so we decided to keep driving. 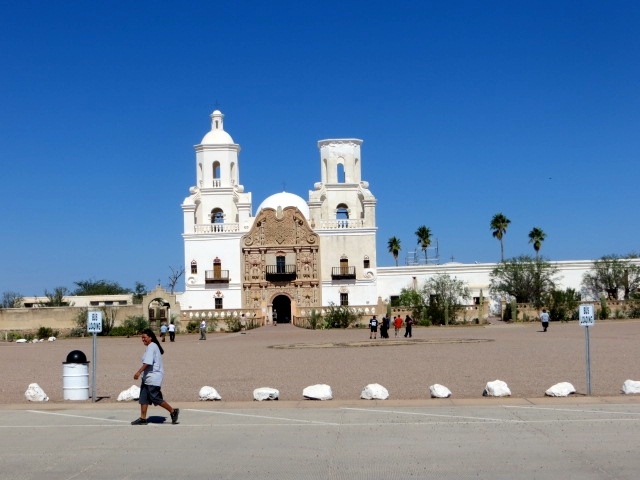 We weren’t tired when we got to El Paso because we had just entered the Mountain Time zone so when we reached El Paso it was an hour earlier than the time shown on our watches. We decided to continue driving; there was another reason to keep going. 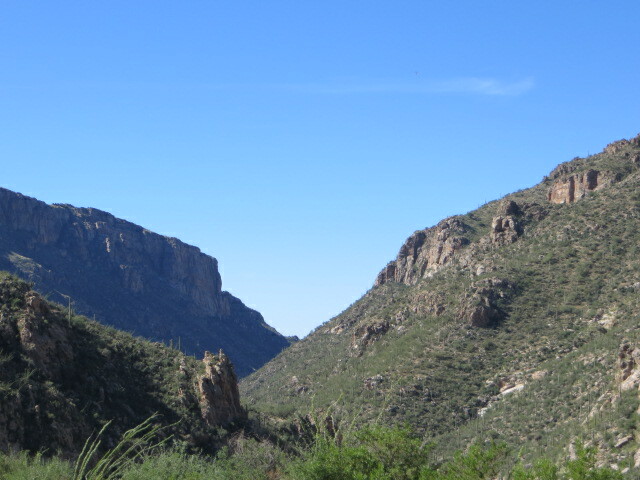 We were getting closer to Tucson and we knew that if we pushed on from El Paso that the next day it would be an easy drive into Tucson. We ended the day staying in a Walmart parking lot in Las Cruces, and as a bonus there was a Starbucks next to Walmart! 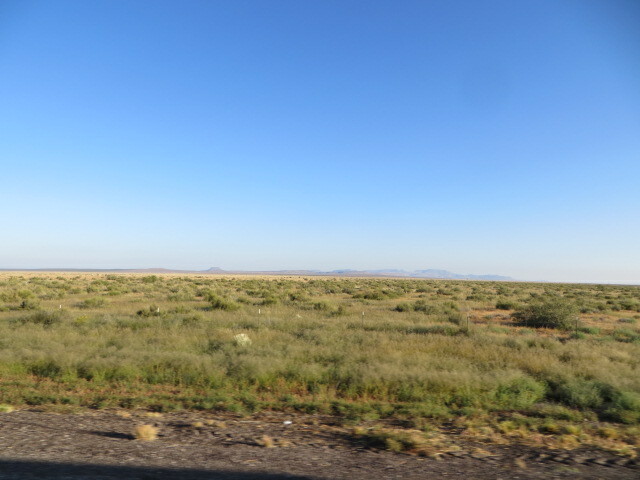 Driving thru El Paso is interesting because you can see Mexico easily from your car and there are numerous open areas that would be easy to cross into the USA. There is no way the “Border” can be secure, because of the vastness of the area. When we get close to close to Arizona we’re like horses headed back to the barn. 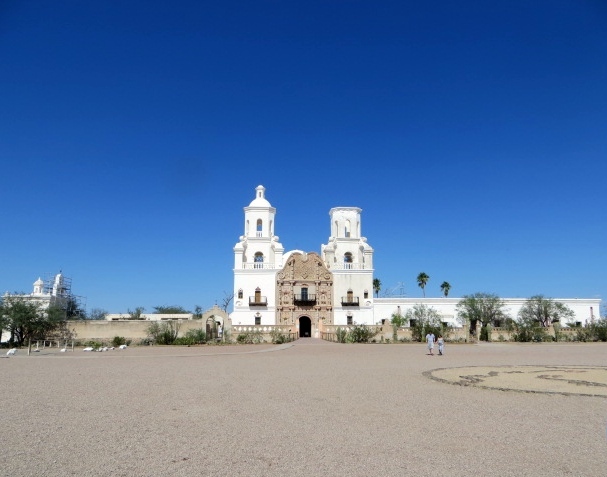 We had an easy drive into Tucson Thursday arriving in the afternoon. It was great to be back in AZ with warm weather, crystal blue sky, and chilly nights! First Stop In Arizona…Great To Be Back! 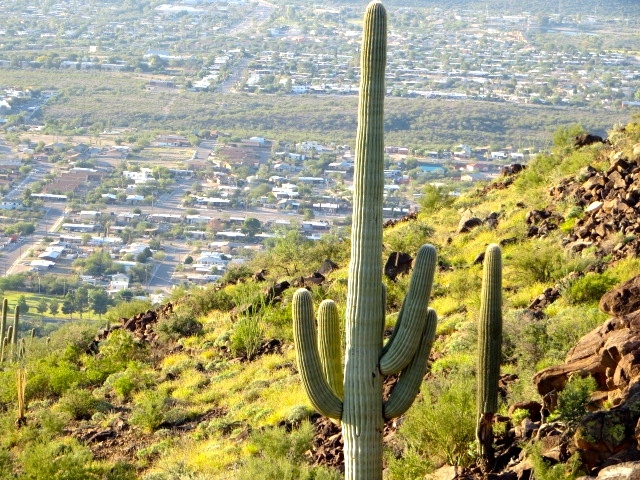 We arrived in Tucson Wednesday afternoon, it felt great to be back in AZ. We arrived to a crystal blue sky and warm temps! We stayed at Far Horizon’s RV Resort which is rated in the Good Sam directory as a 10/10/10 resort. This is the first perfect score that we have seen; but we’ve learned that you can’t rely on the Good Sam rating system. Far Horizon is a nice park with friendly staff; lots of “snow birds” spend the winter in this park and they are beginning to arrive. The park was one of the cleanest parks we have ever seen, with pool, hot tub, cafe, etc. Our first night we went to Renee’s Organic Oven for a vegan pizza dinner! 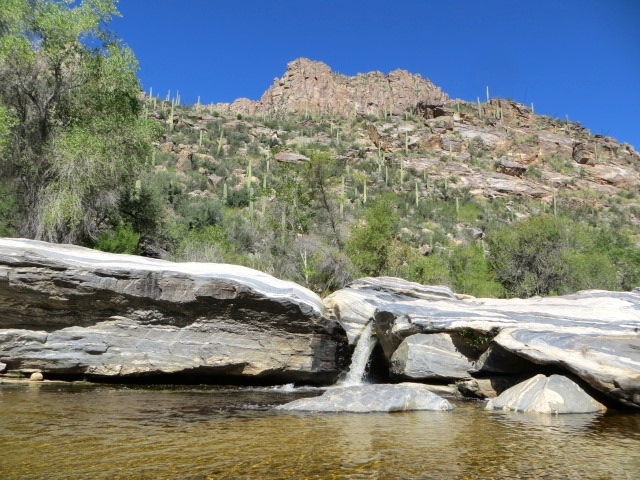 Thursday we visited Sabino Canyon, a beautiful canyon located in the Catalina Mountains and part of the Coronado National Forest. 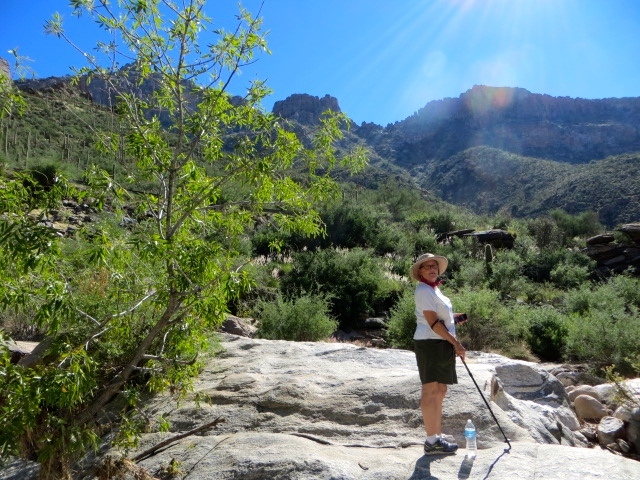 We rode a tram to the top of the canyon; and hiked three and half miles back to the car. 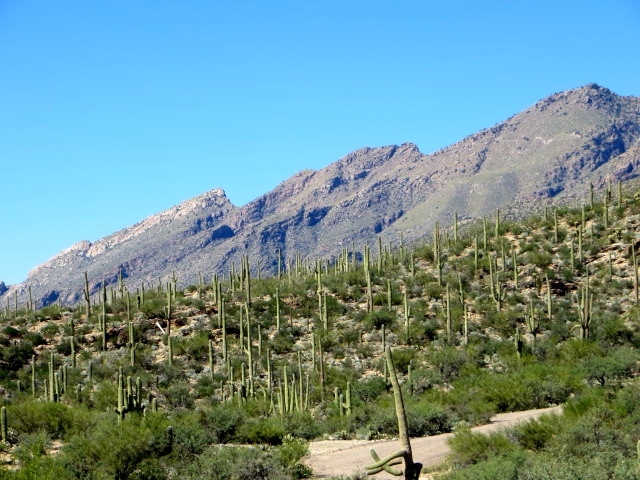 It had been hot in Tucson with record setting temperatures. We got to the car a little after noon; it was ninety-five degrees. 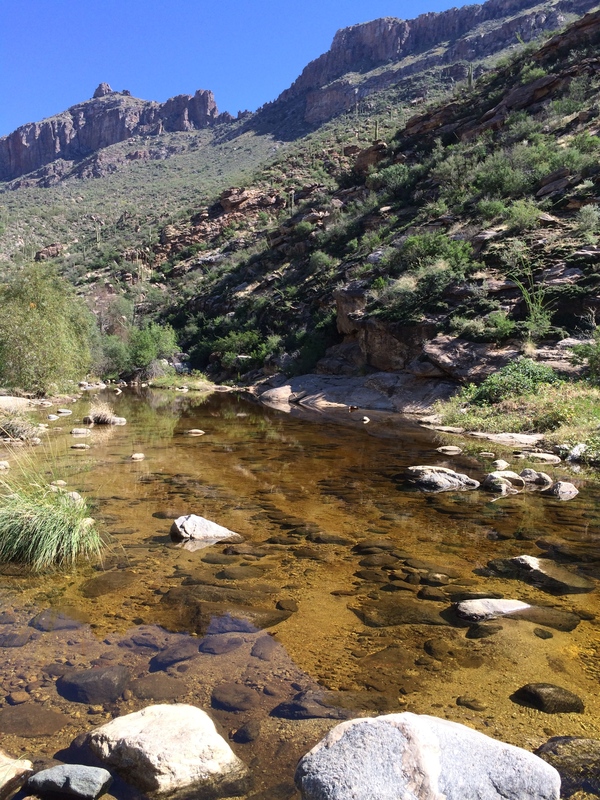 The canyon is absolutely gorgeous and with the recent rain in AZ the streams are flowing strongly with waterfalls, an unusual and beautiful site in the desert. 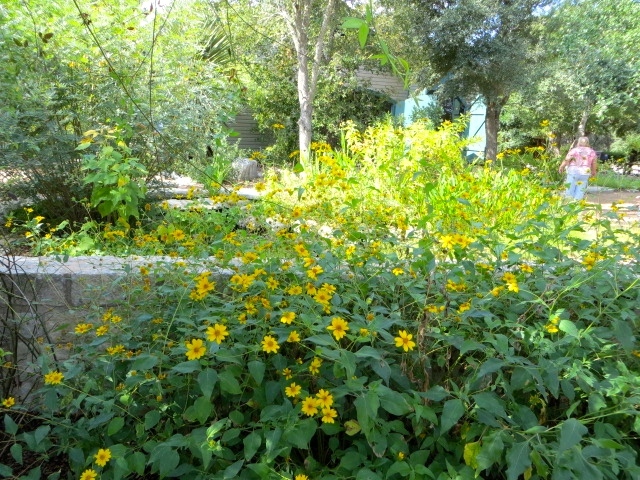 Friday morning we visited the Tucson Botanical Gardens named by Reader’s Digest as the Best Secret Garden in America. 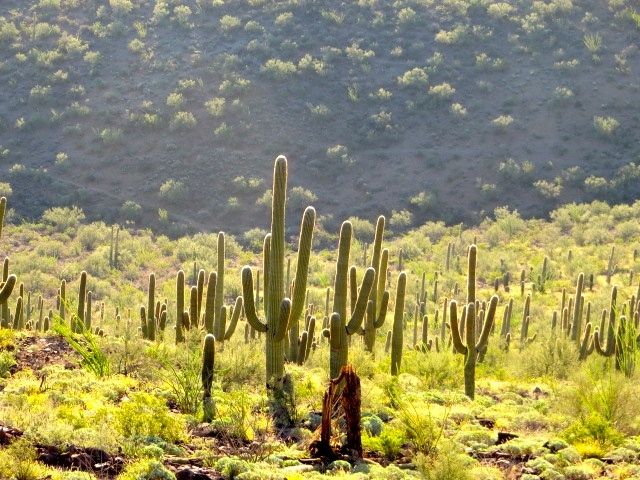 Tucson Botanical Gardens is an “Oasis in the Heart of Tucson”. 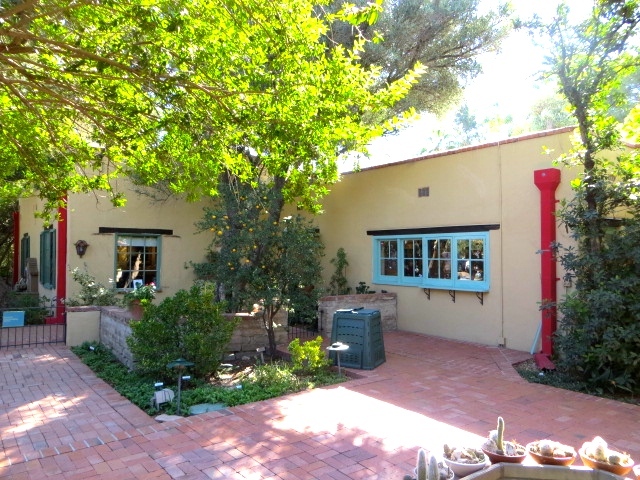 It began as the personal residence of a landscape architect who left it to the city of Tucson. 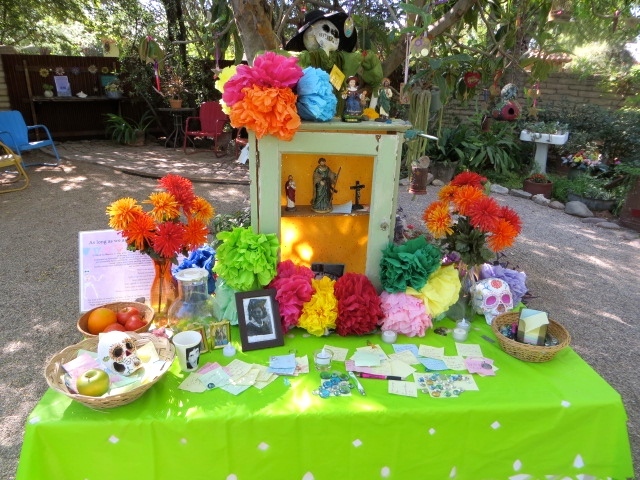 It is seventeen acres surrounding the residence with small residential gardens, which include a Barrio Garden, Zen Garden and a Cactus & Herb Garden. 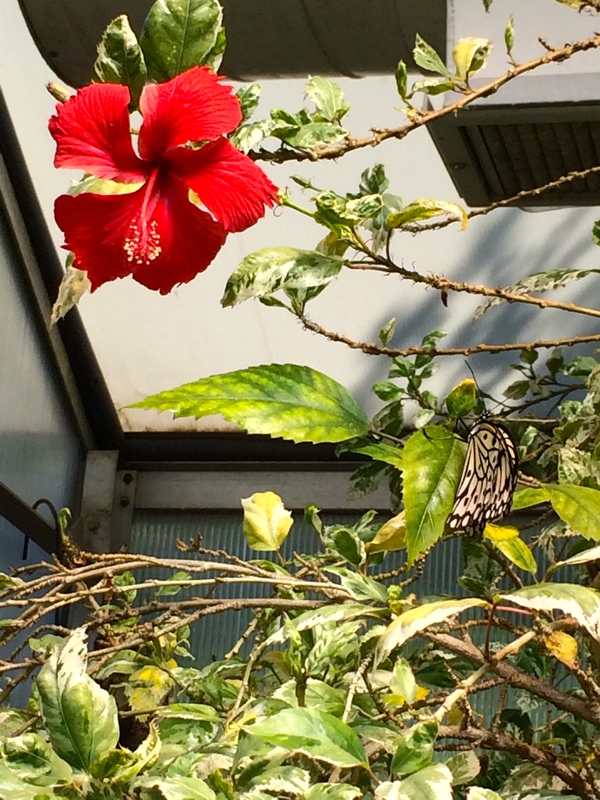 The docent that led our tour was excellent; one of the most unusual things is an orchid and tropical butterfly building featuring butterflies from around the world. 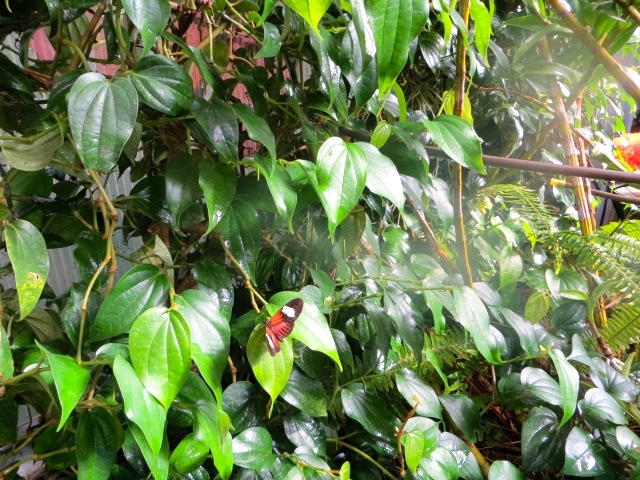 It was another hot day and the shady gardens offered a respite from the heat. 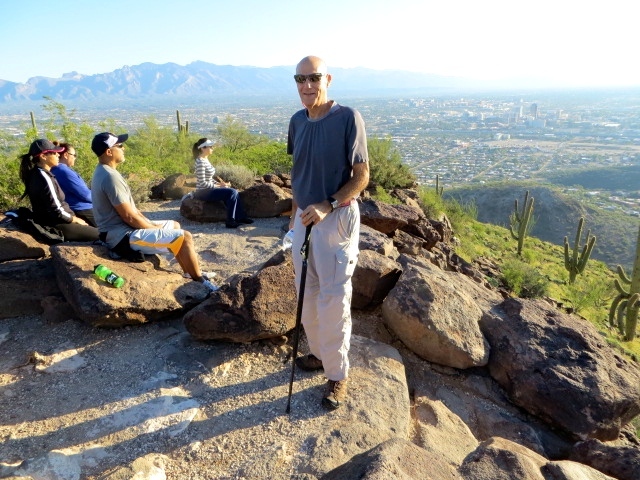 Saturday morning Eddie got up early to hike Tumamoc Hill; a hike that he heard about. 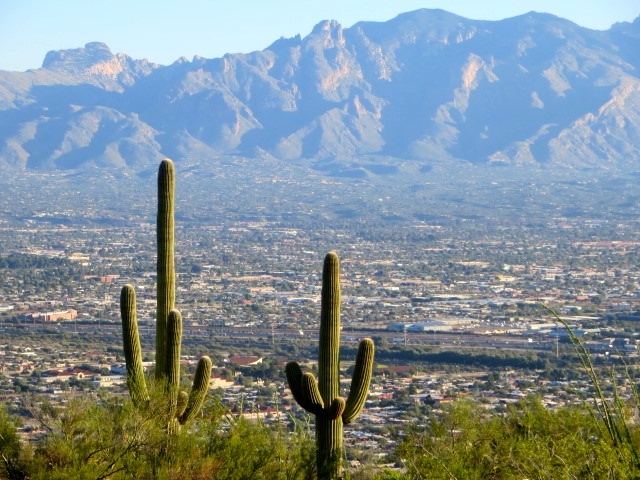 Tumamoc Hill is owned by The University Of Arizona and is suppose to be a strenuous up hill hike and a good work out with eight hundred feet of elevation gain in the mile and half up hill trail. Due to the heat, Eddie got there early (6:30 AM) and it was already crowded. In AZ during the hot weather you start early. Tumamoc Hill is a park with beautiful landscape but it was crowded. Supposedly there is a site at the top of Tumamoc Hill with the remains of a 2300-year-old abandoned settlement but Eddie did not see anything that looked like an abandoned settlement. 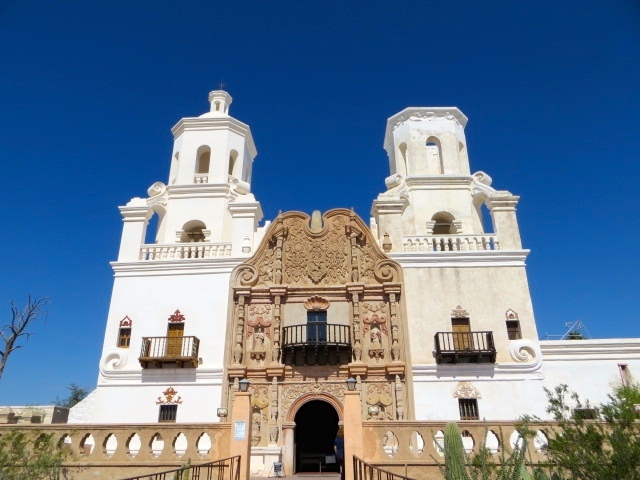 Later we headed off to a farmer’s market and to tour Mission San Xavier del Bac a fascinating mission! 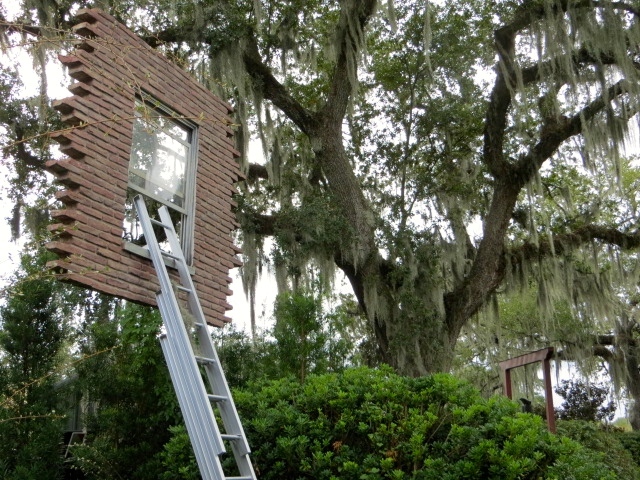 Built in the 1700s, it has recently been restored actually it is a restoration still in progress. 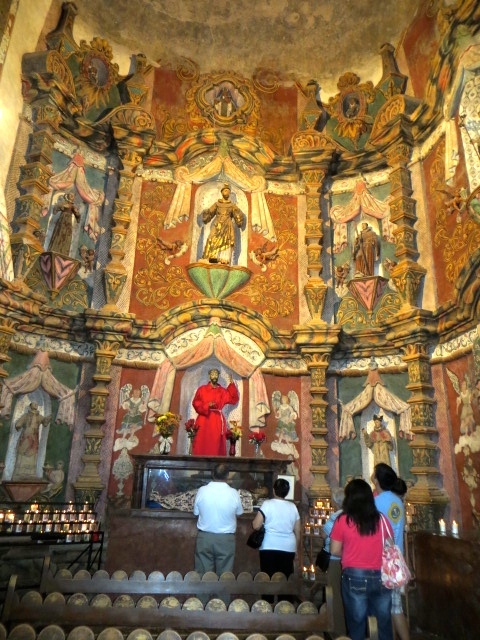 It is a white adobe church, an example of Spanish colonial architecture. Our docent/tour guide was excellent; and she made the tour interesting. She was a tour guide at The National Cathedral in Washington, DC. One of the facts that she passed along that Eddie loved hearing was how two beautiful golden lions in the church that had been destroyed were redone. 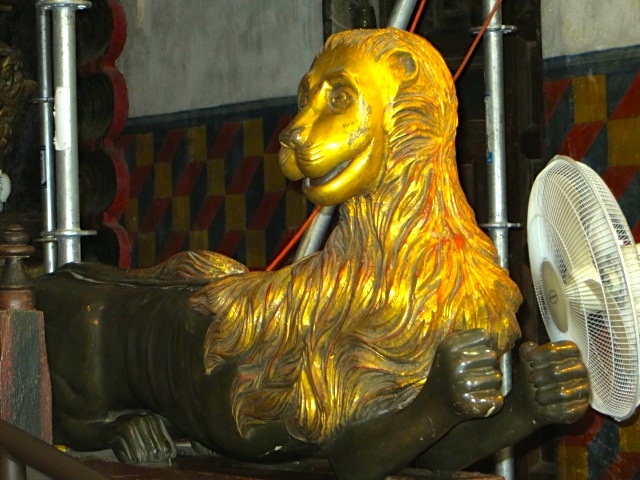 Gaby Gifford’s mother found an artist who could recreate the lions, and she also paid to have them replaced. 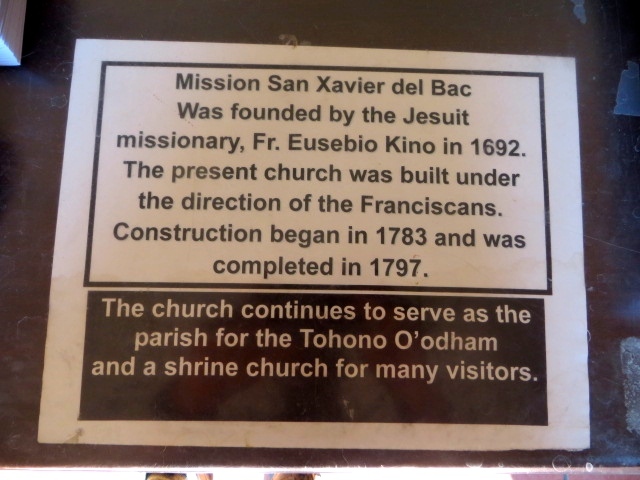 Gaby Gifford’s mother is Jewish and the Mission San Xavier del Bac is not a museum, it operates as a Catholic Church. We got back to The Turtle tired and hungry at the end of a long day Saturday. Sunday we got up and prepared to leave for Phoenix. We were finishing a wonderful month long trip across America. We are excited to get back to Phoenix! ← Chapter 2 | Washington D.C.